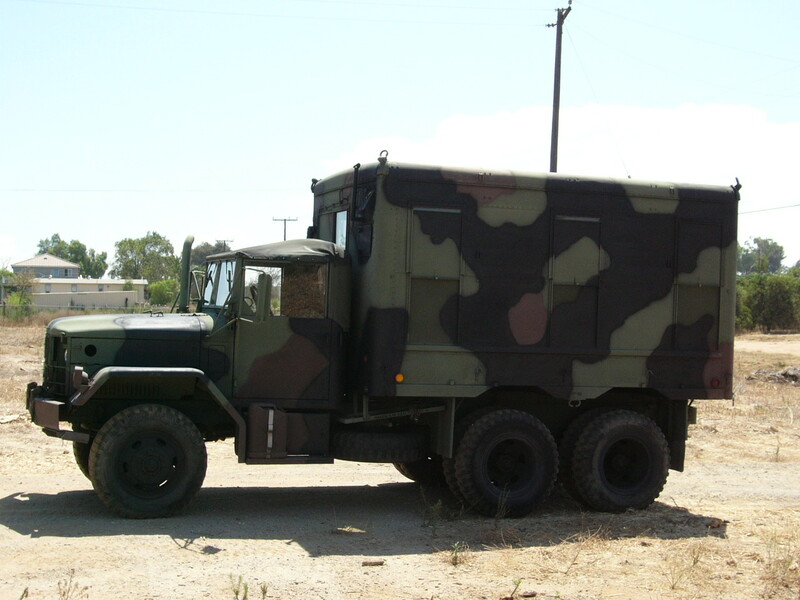 This truck has already been sold. I’m preserving the for-sale listing here because I’ve received many compliments about its thoroughness, and there are lots of good pictures here. 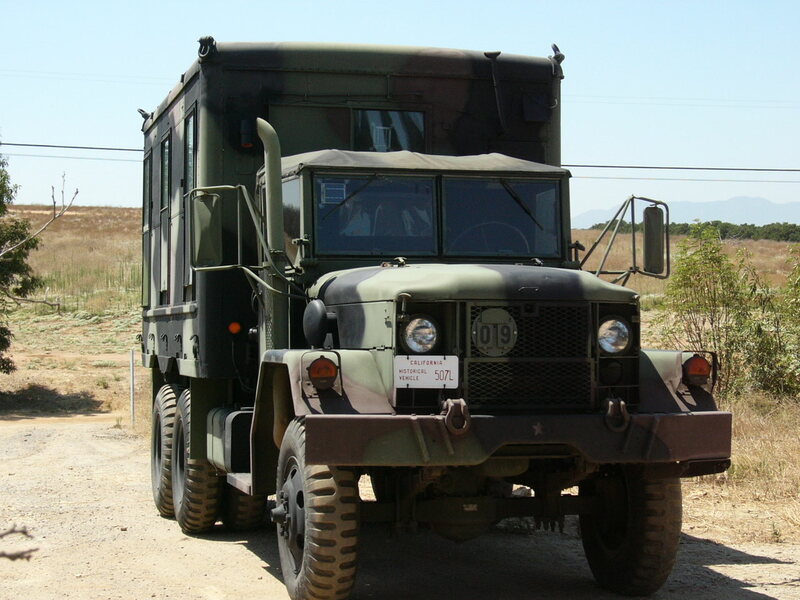 This restored 1970 Kaiser-Jeep M109A3 2.5-Ton 6×6 Shop Van is in really good shape. 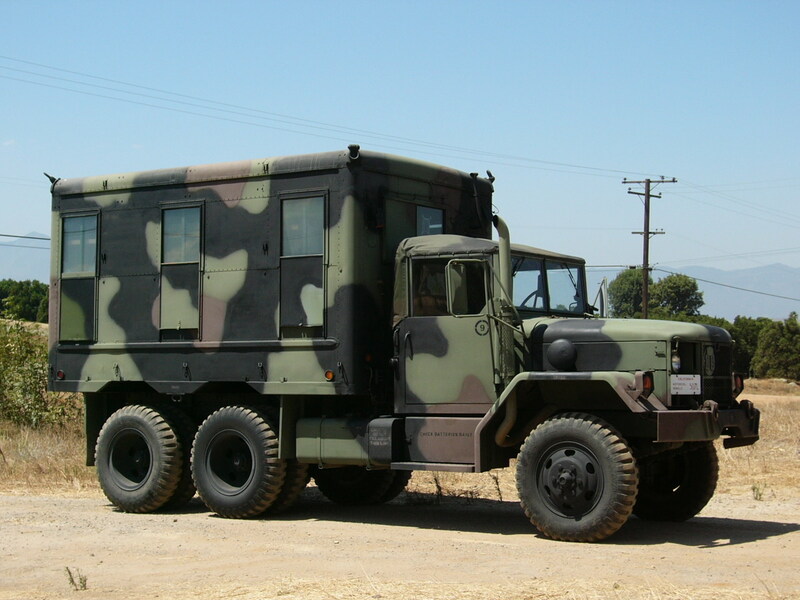 It looks good, runs well, it’s ready for work, play or display, and you could drive it home if you want. 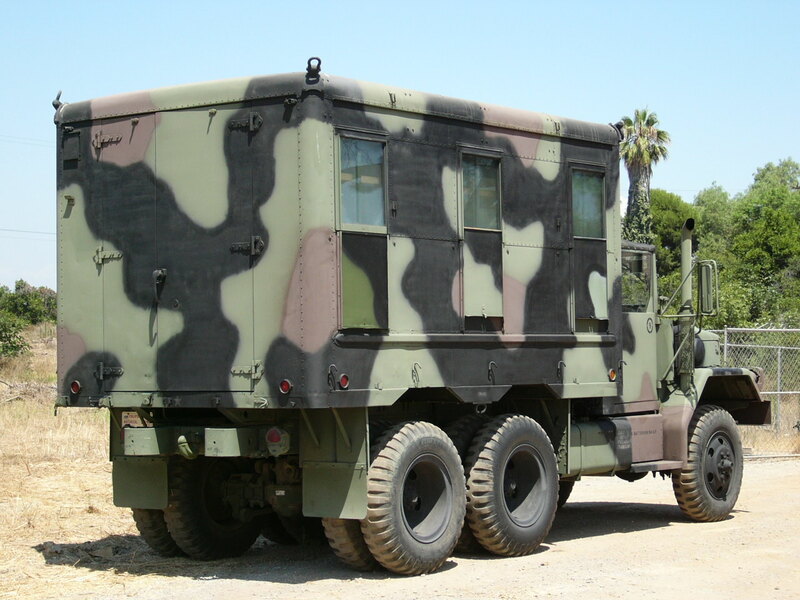 I had originally planned to convert it to a combination camper and radio truck, and I’ve done a lot of work in the van box towards this goal. I’m selling it now because I’ve realized that I don’t really enjoy driving these things, so I’ll probably never use it the way I intended to. 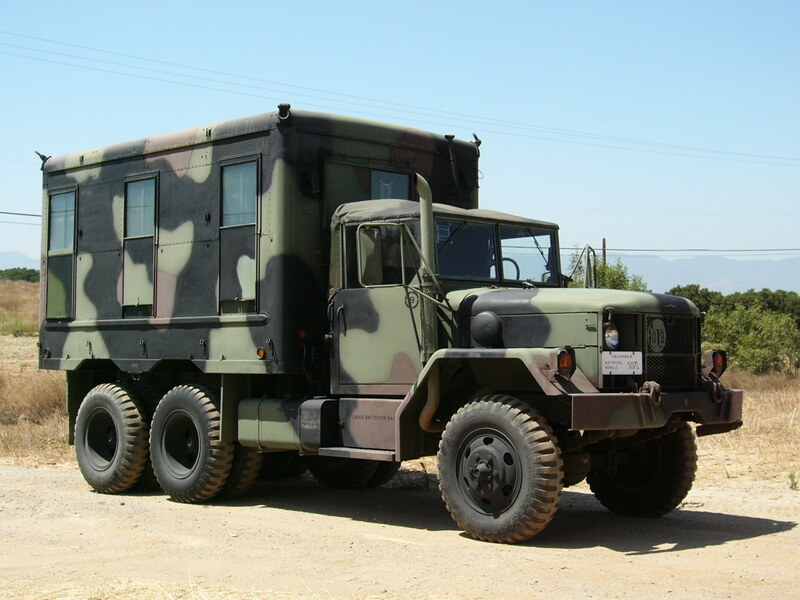 I know I won’t recover the money I have into it, because I paid top dollar for a fine truck and then spent a lot more getting it shipped across the US… before I even started spending money on van box upgrades! Oh, well… my loss is your gain. 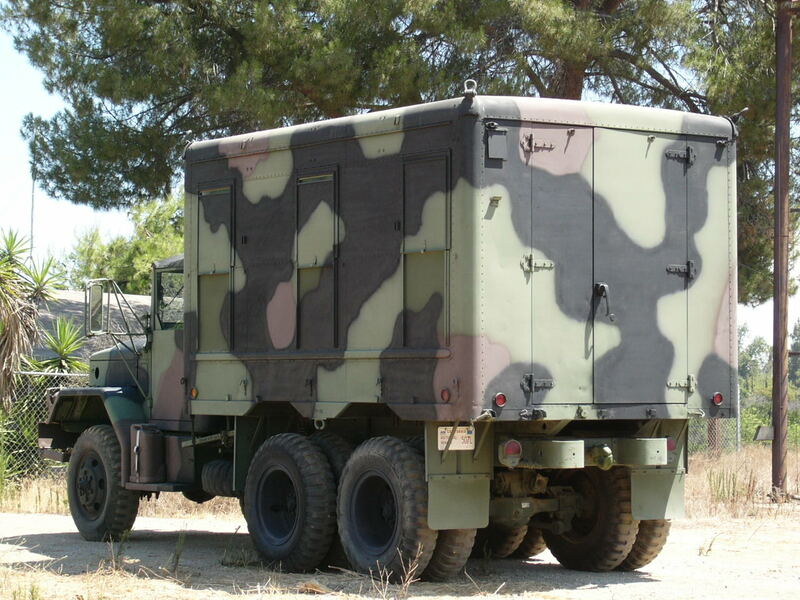 Mechanically, the truck is in fine shape. 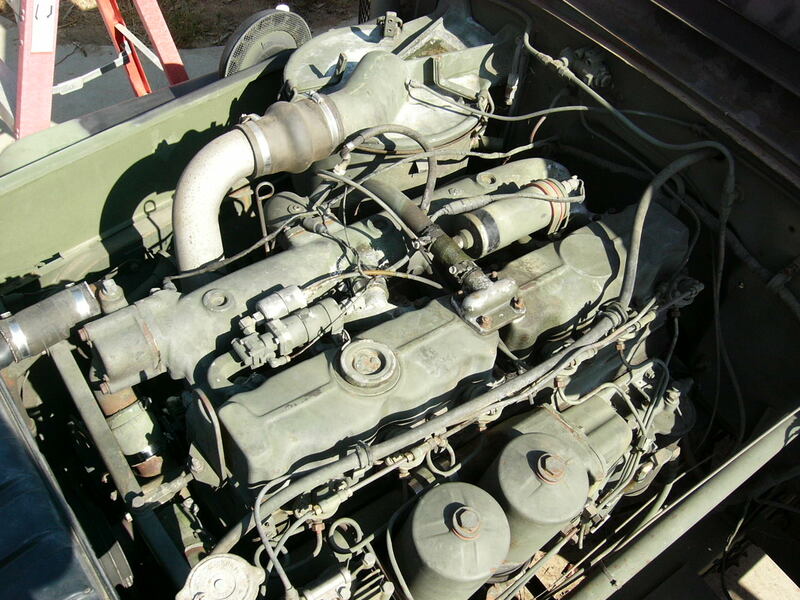 The only thing that even comes close to a mechanical problem is that the starter bendix occasionally sticks and doesn’t engage the flywheel. When that happens, a second press of the starter button always pops it loose, and the engine always starts quickly and easily. I’ve had a lot of deuces, and this is probably the easiest-starting of all of them. I’ve included a Quicktime movie on this page of the first cold start after the truck has sat for a couple of weeks, so you can see and hear how quickly the engine catches. 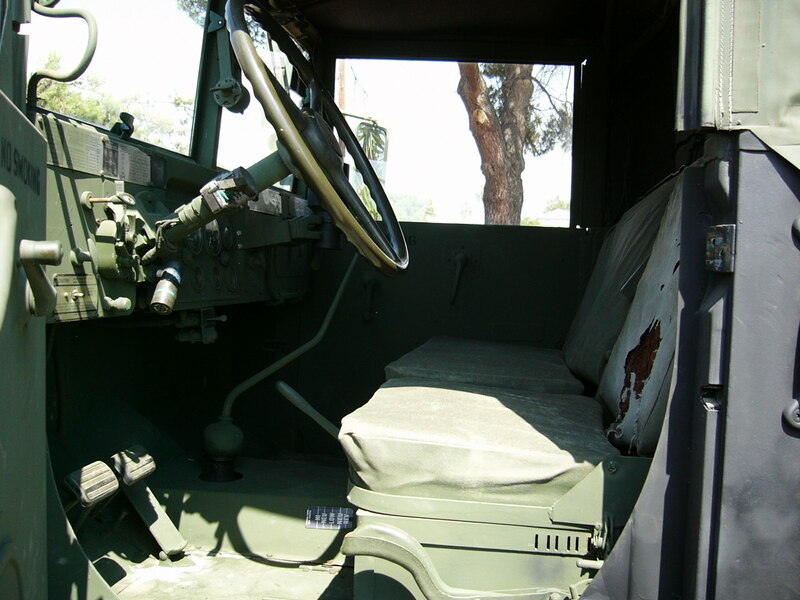 The truck shifts, drives, steers and stops just fine. 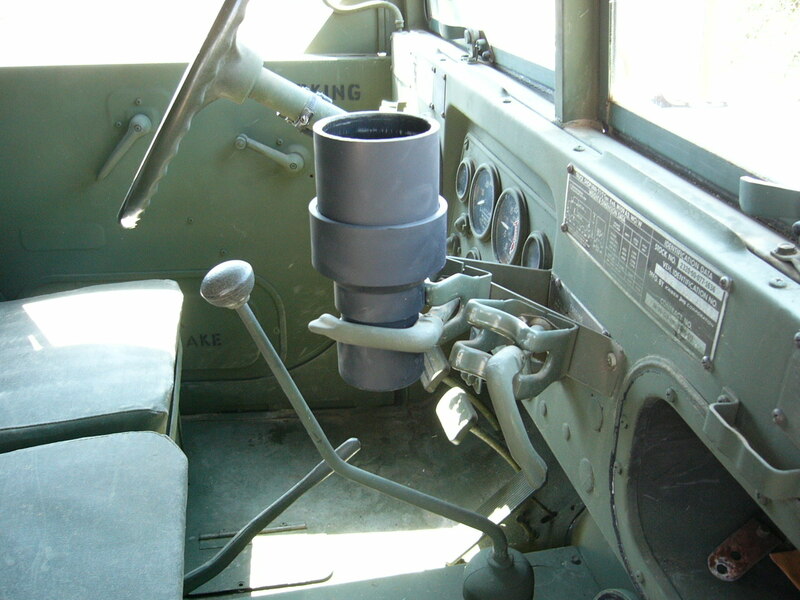 The horn and lights all work. 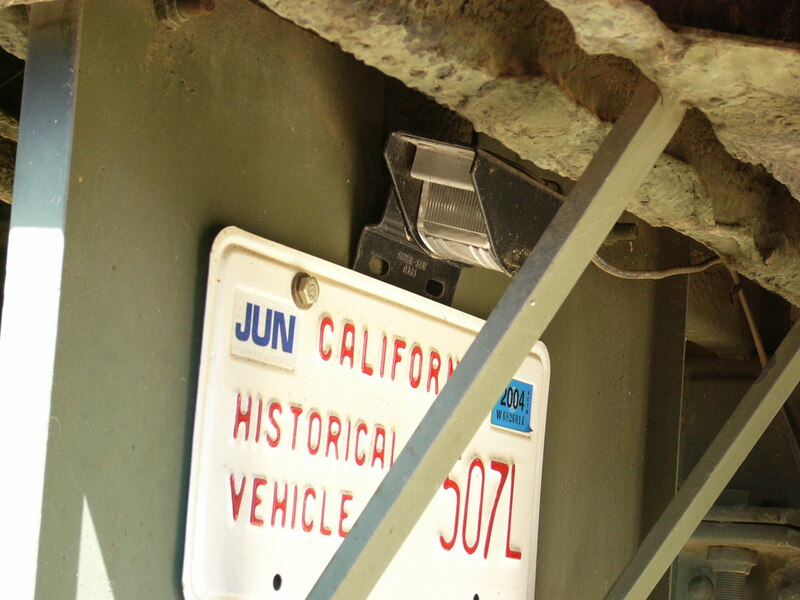 Outside the van box, the truck is in almost original configuration, except as noted here: I’ve added a lighted license plate holder on the rear; it’s tucked up high on the left mud flap mount, and it’s wired into the lighting non-destructively with a home-made “Y” connector. 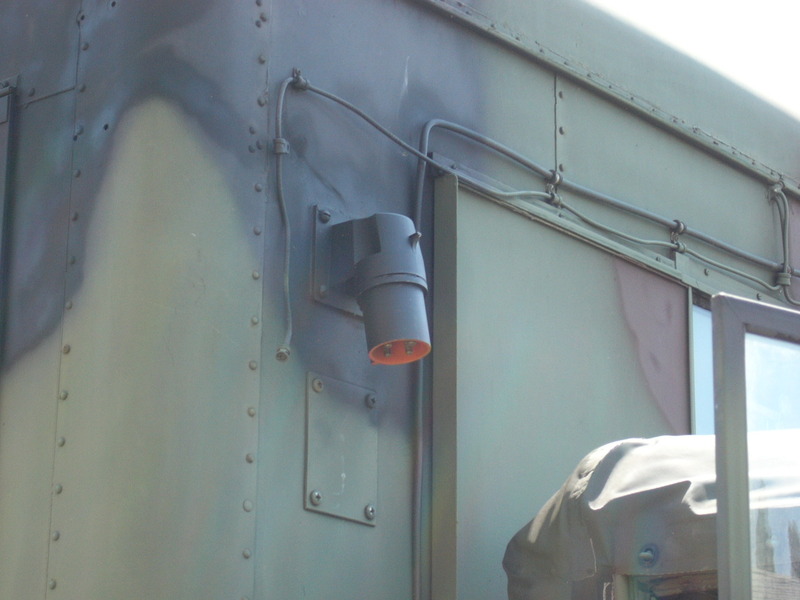 I’ve also added a blue/white dome light (as used in some US armored vehicles) in the cab. 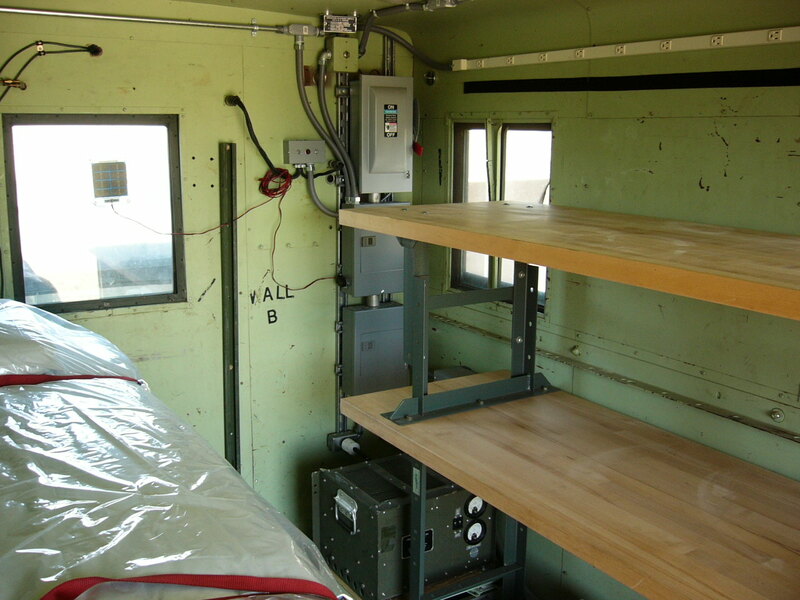 It’s suspended between the two rear cab bows with “P” loops. I’ve replaced the original 6TL batteries with Optima batteries, mounted in Optima’s 6TL battery adapters. 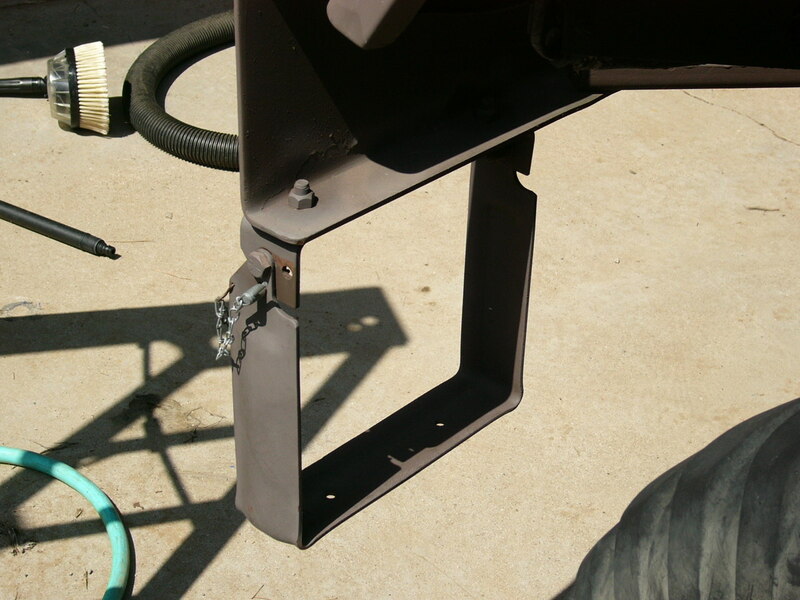 The frame and “J” bolts are included if you want to switch back to 6TL batteries. I’ve inserted a keyed battery disconnect switch into the positive battery lead. 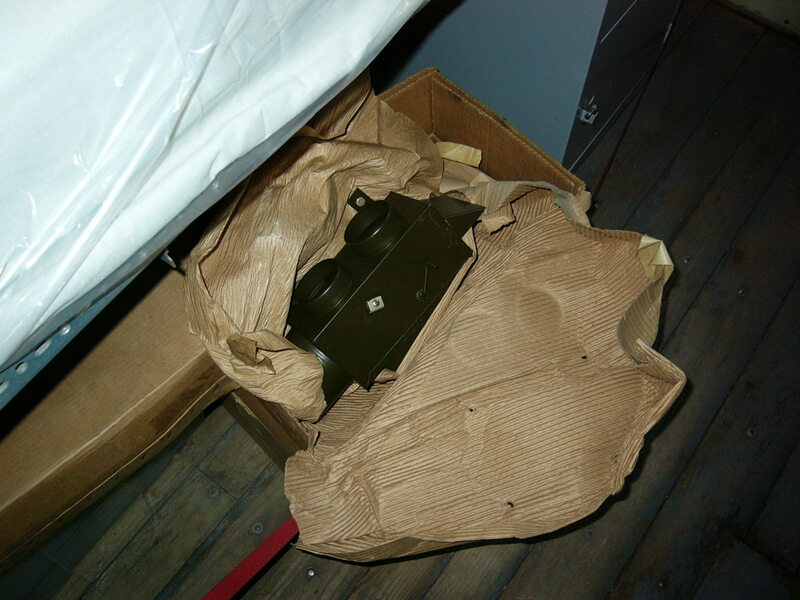 It’s a heavy-duty metal-cased one, not one of those cheapy ones from the auto parts store. 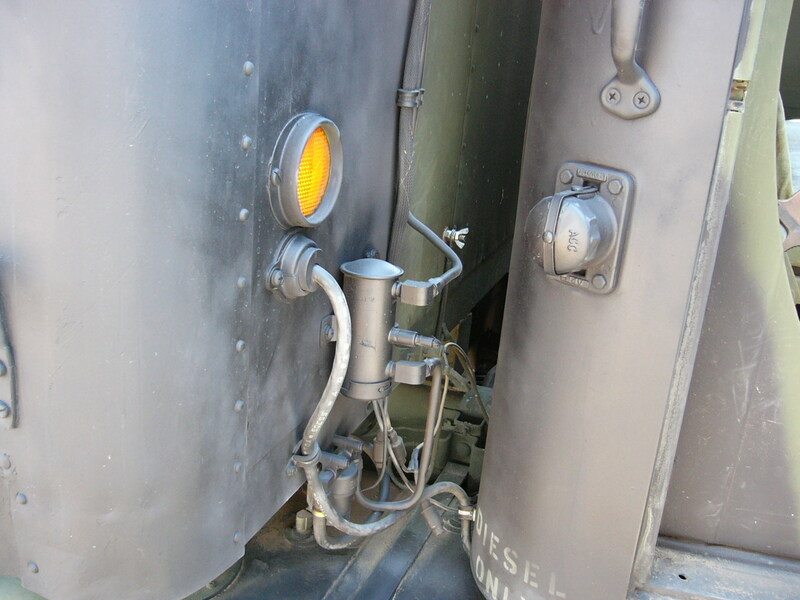 The cab light is on the un-switched side, to help you find the key hole in the dark. There’s also a Solargizer to help keep the batteries topped up. 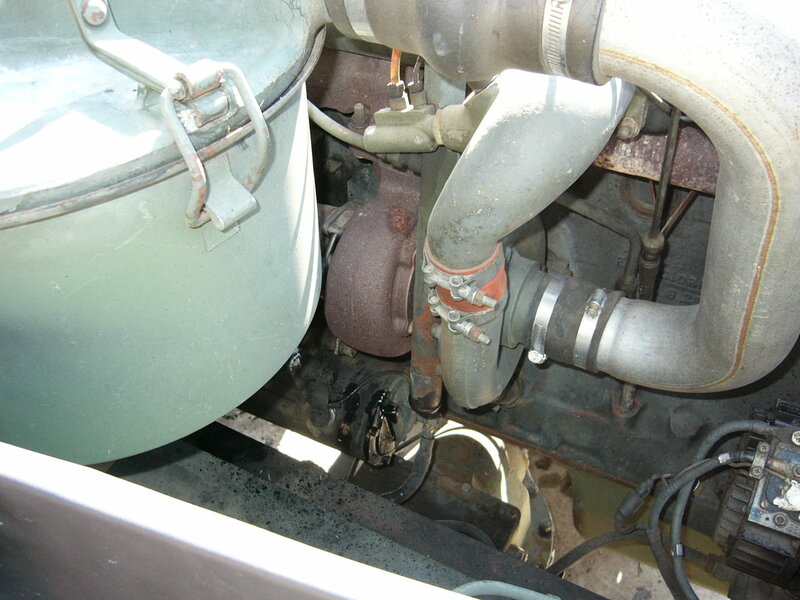 There are one or two small oil drips from the engine compartment. The axle seals are all good. 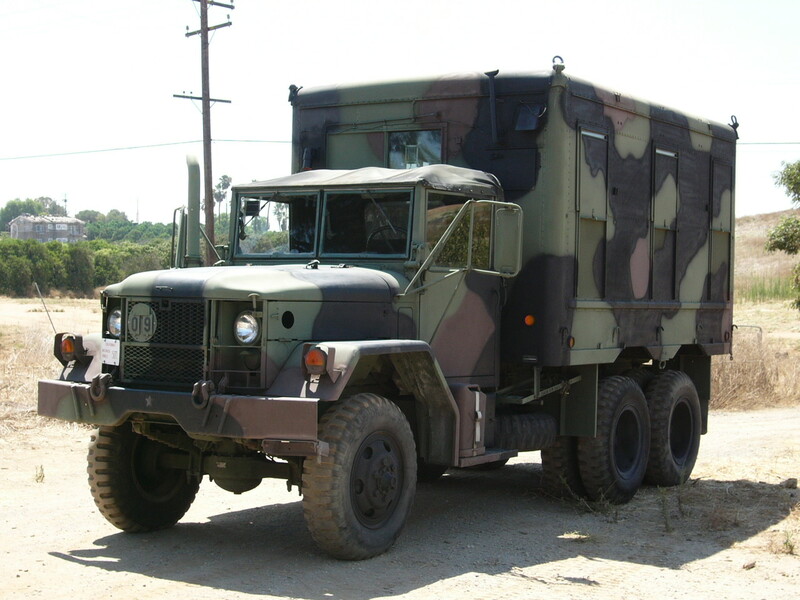 I replaced the front axle seals and boots in 2002, and I haven’t had to touch the rear ones. 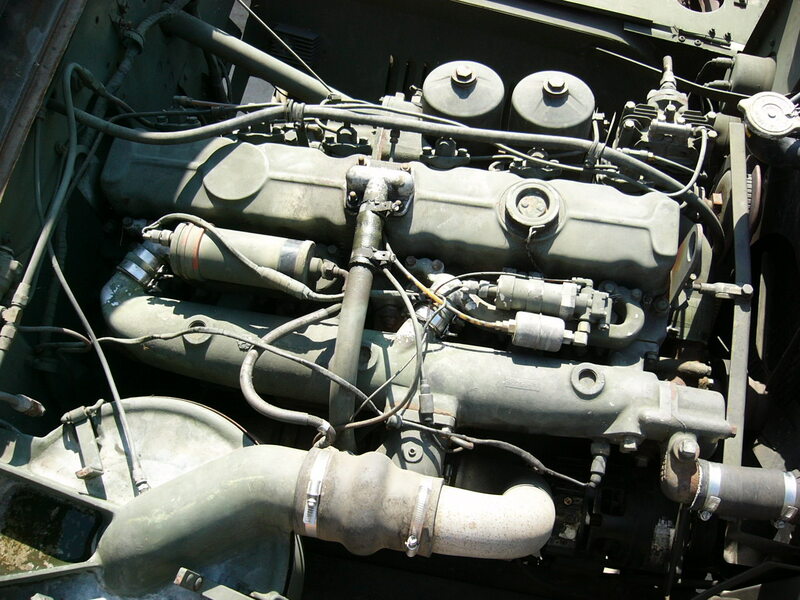 Cosmetically, the truck is also in fine shape. 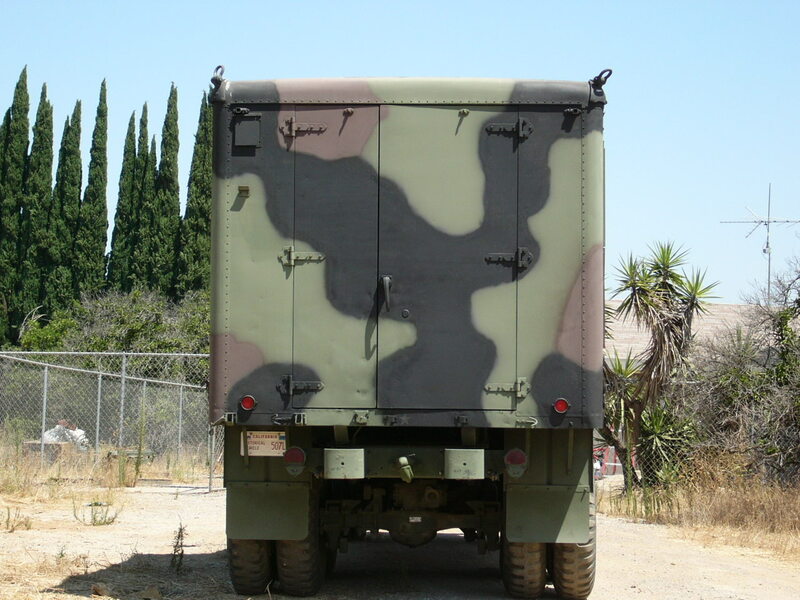 The previous owner painted it in 3-color camo (green, brown and black) using CARC paint in 2001. I’ve done some touch-up with non-CARC paints. In particular, the black CARC has gotten pretty chalky after a few years in the sun, as original formulation CARC does. I’ve re-done the black areas with flat black non-CARC paint. I used spray cans and my results aren’t show-room quality, but it’s still a lot better than the typical sloppy military paint job! The black areas are a bit streaky, so maybe I’ll go over them again with a good HVLP gun if I get around to it before the truck is sold. I also stripped, etched, primed and re-painted the right rear blackout cover on the van box, because its paint was peeling off. 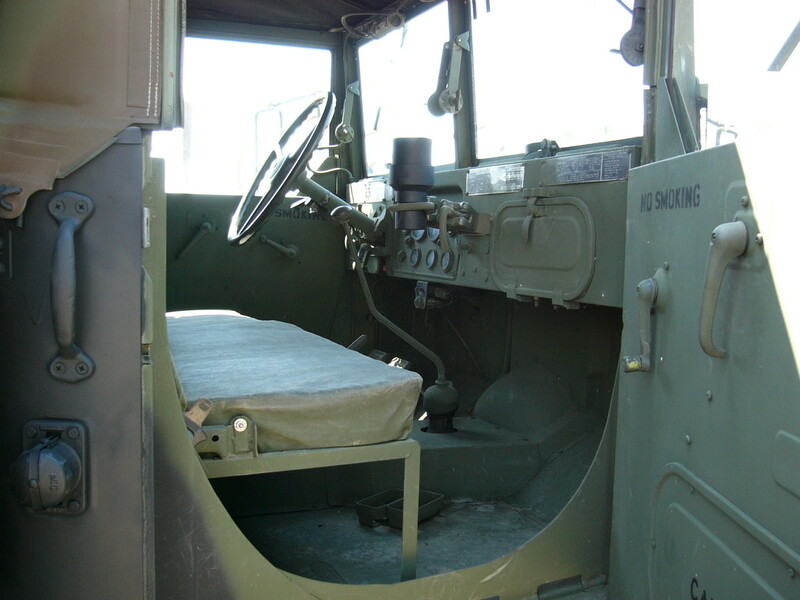 The cab has a vinyl soft top, and the older box-style driver’s seat. 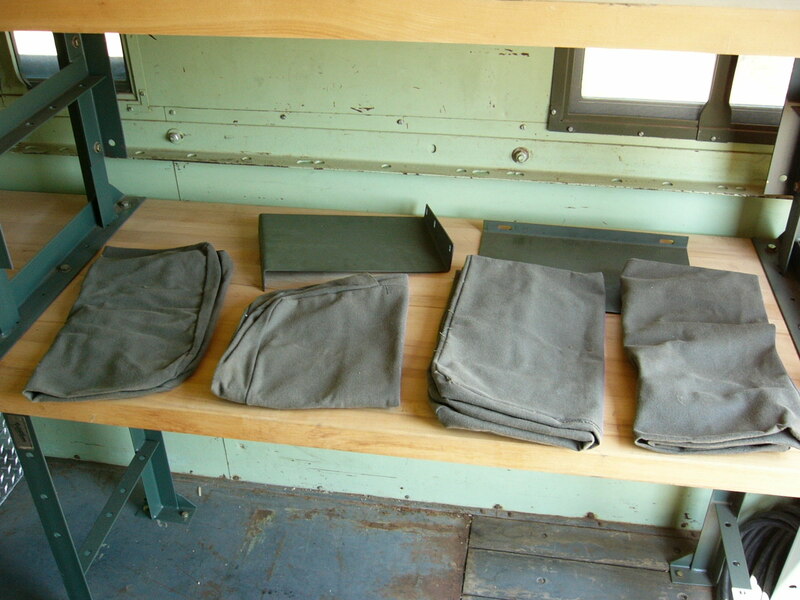 The driver’s seat back cushion is thrashed and the other cushions are a bit dirty, so I’m including a set of four new seat covers from John Tennis with the truck. I haven’t installed them, so they’ll remain minty-fresh for the new owner. 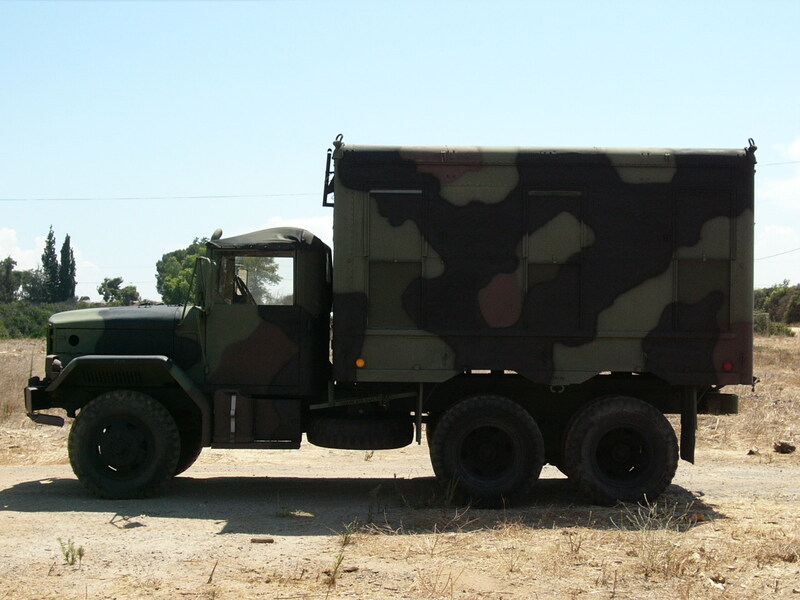 I’ve done a number of small repairs recently to get this truck into top shape for its new owner. As I mentioned above, I touched up the black paint and re-painted one of the blackout covers. 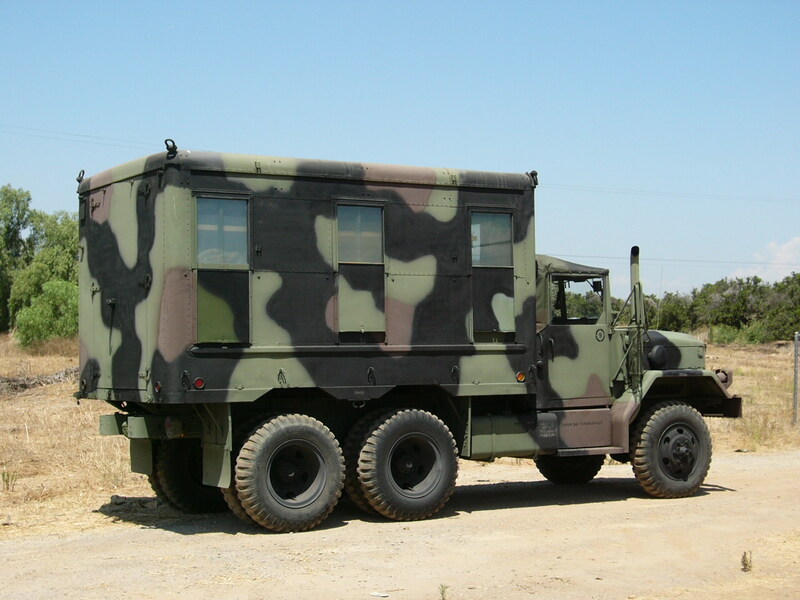 The windshield wiper arms and blades are new, and the spare tire has a new tube. The right windshield washer motor is missing a plate which limits arm travel, so it’s necessary to twist the manual lever to re-engage the sector gear, but then a brand-new air wiper motor doesn’t work much better, IMHO :-). I also replaced the 6TL batteries with those Optima batteries recently. The right rear glad hand valve (on the emergency line) was leaking, so I replaced it with a new brass ball valve. 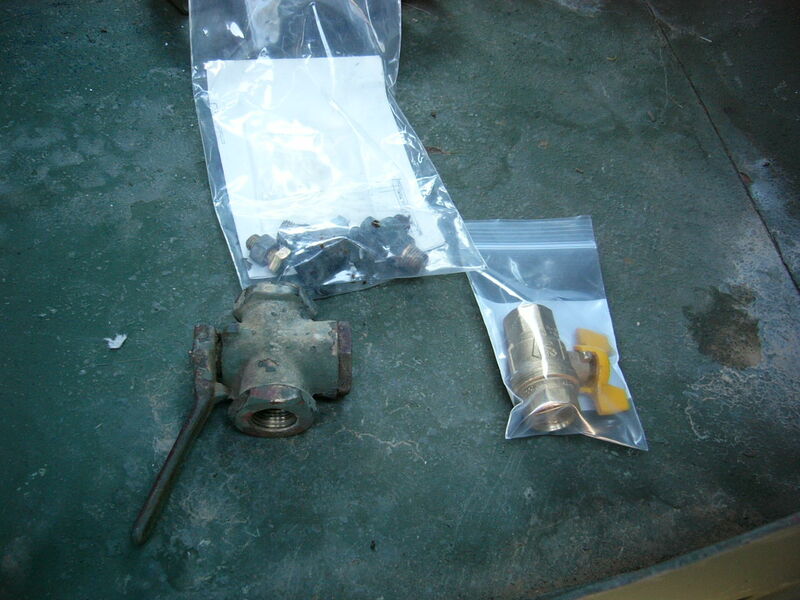 I’ve included another identical brass ball valve in case you want to replace the service valve, too. 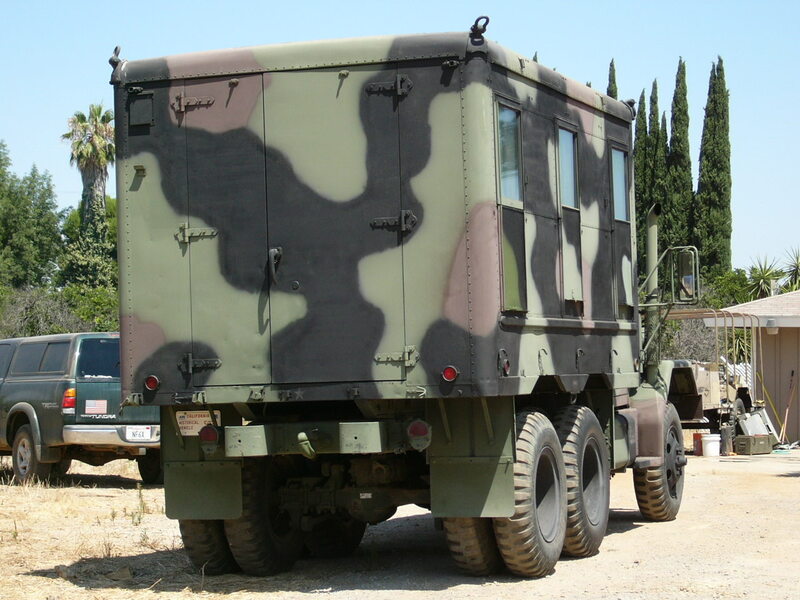 This truck doesn’t have a cab heater, but I’ll include a NOS hot-water cab heater kit, along with a set of reproduction heater box mounting plates (which weren’t included in the military heater kit for some reason) from John Tennis. I’ve made a lot of modifications and upgrades inside the van box. See the pictures and text below for details. 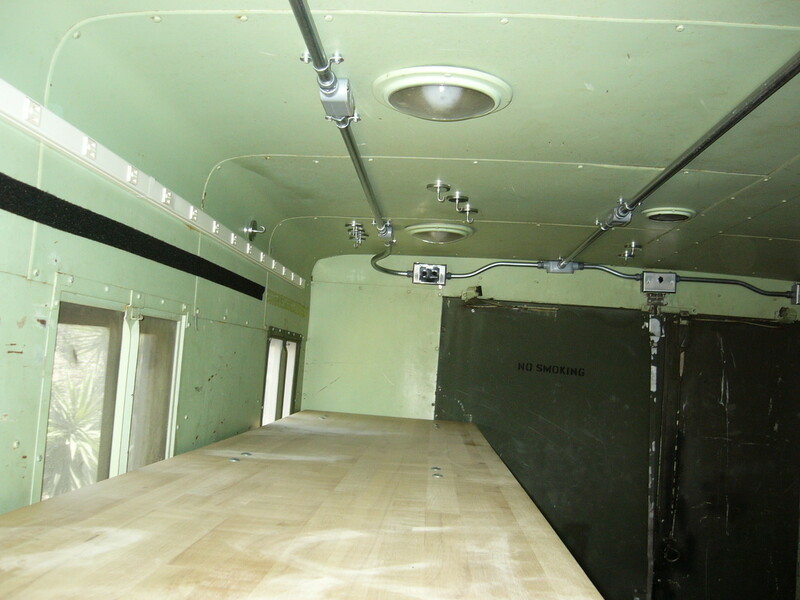 Some of the van box window frames have separated and need to be repaired. 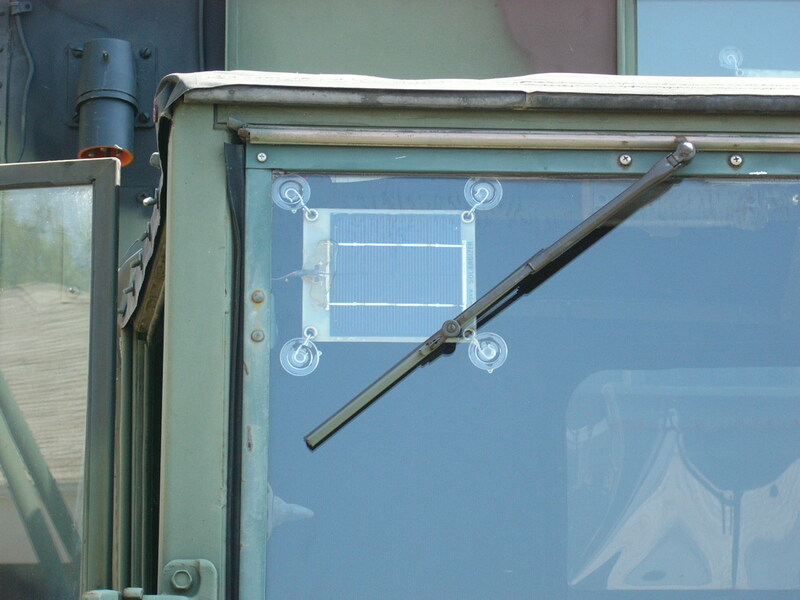 I recommend that the blackout panels be slid up a few inches to help secure the windows while on the road until that is corrected. Don’t slide them all the way up, though, because those blackout panels are notorious for flying off on the road because of their cheesy latches, which were pretty marginal when they were new. One of the window screens needs to be repaired. 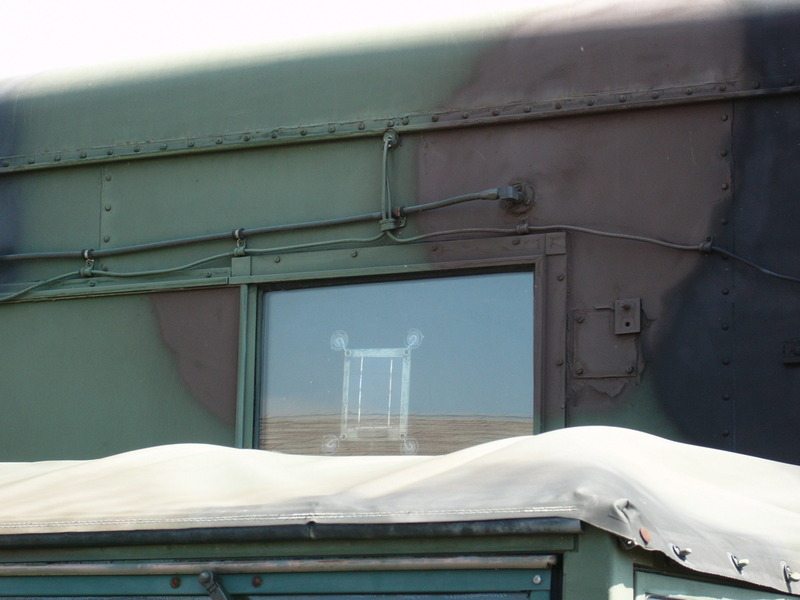 Some of the screens and window frames are in nearly new condition. 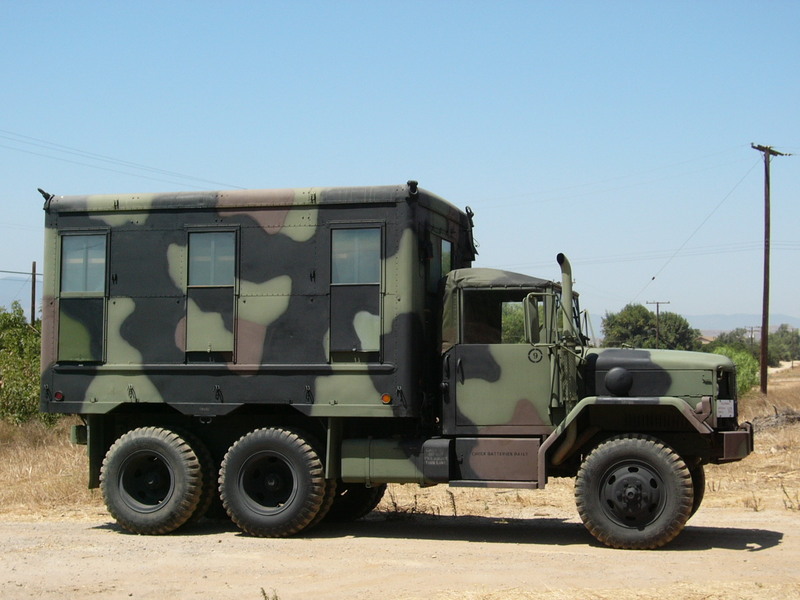 Here are a bunch of pictures of the exterior of the truck. 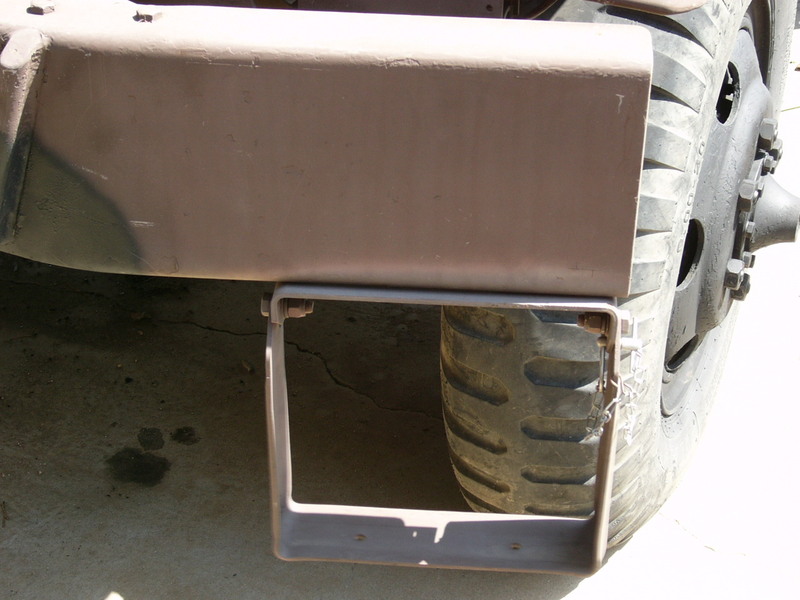 I added a lighted rear license plate holder near the top of the left mud flap. It’s non-destructively tapped into the lighting with a waterproof “Y” connector. 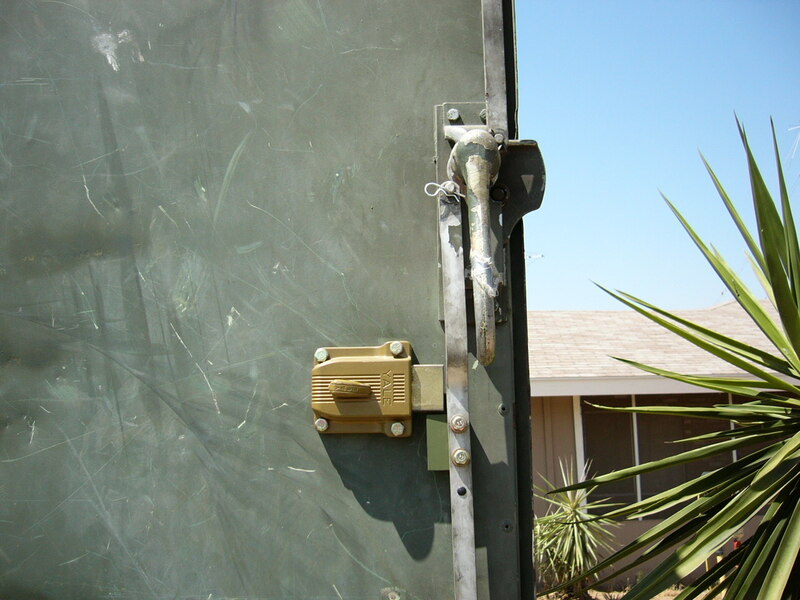 I installed a Yale lock on the van box doors. 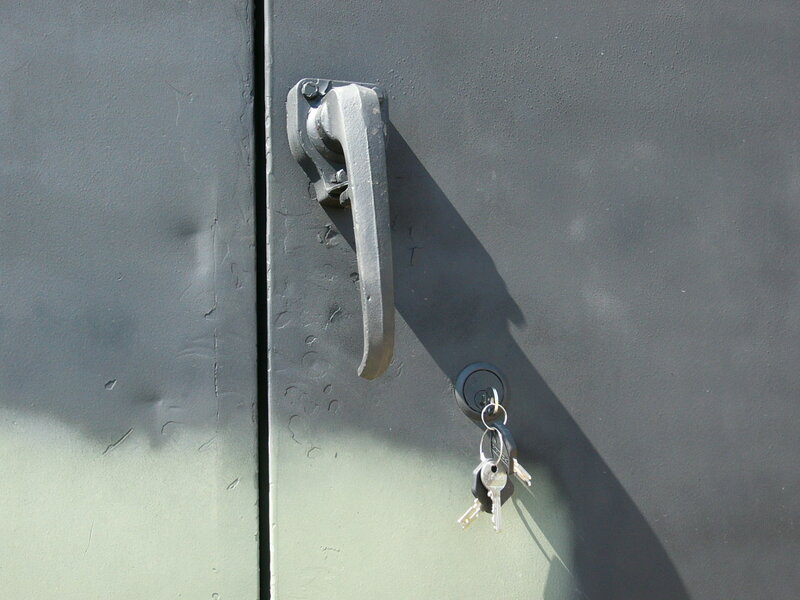 It’s keyed on the outside, and locks and unlocks without a key from the inside. 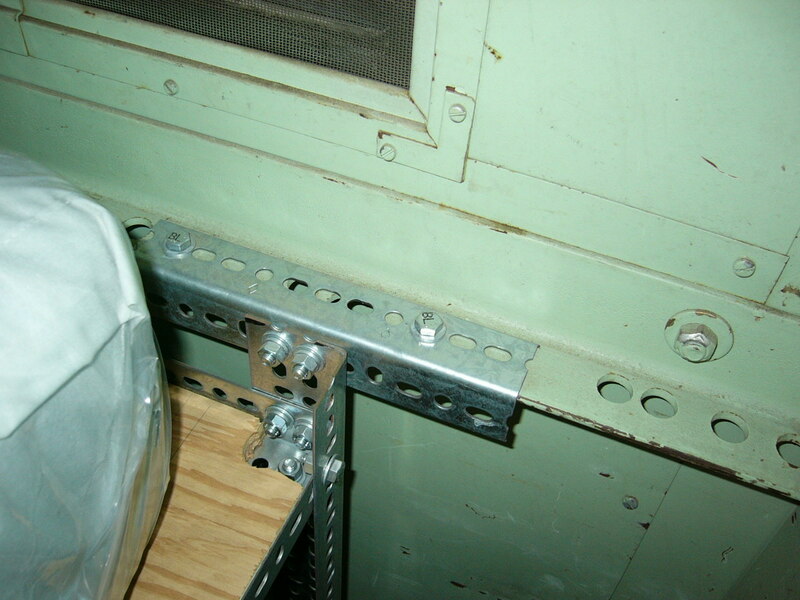 I mounted it so that its bolt blocks the travel of the door’s lower latch via a 1/2″ thick steel block bolted to the draw bar. 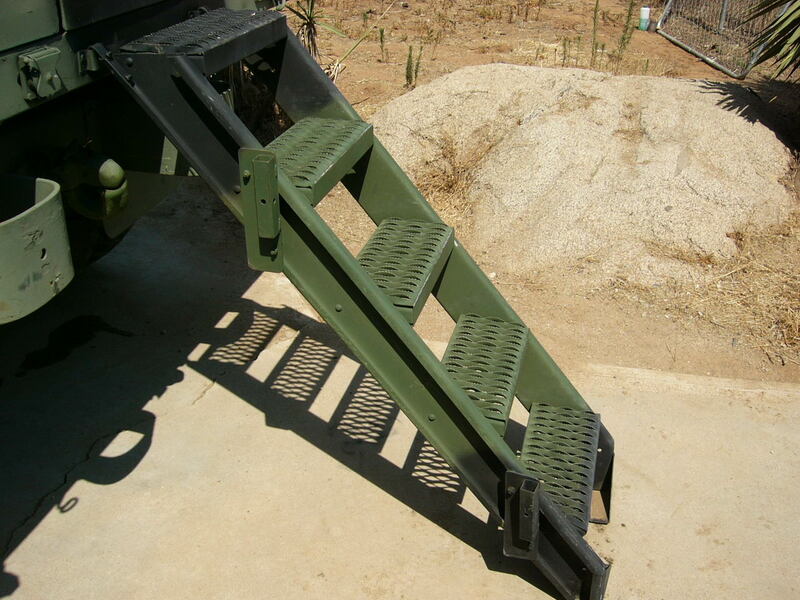 The aluminum boarding ladder doesn’t fit in the storage brackets on the back of the van box, but it’s a lot lighter than the original (and hard to find) steel one. 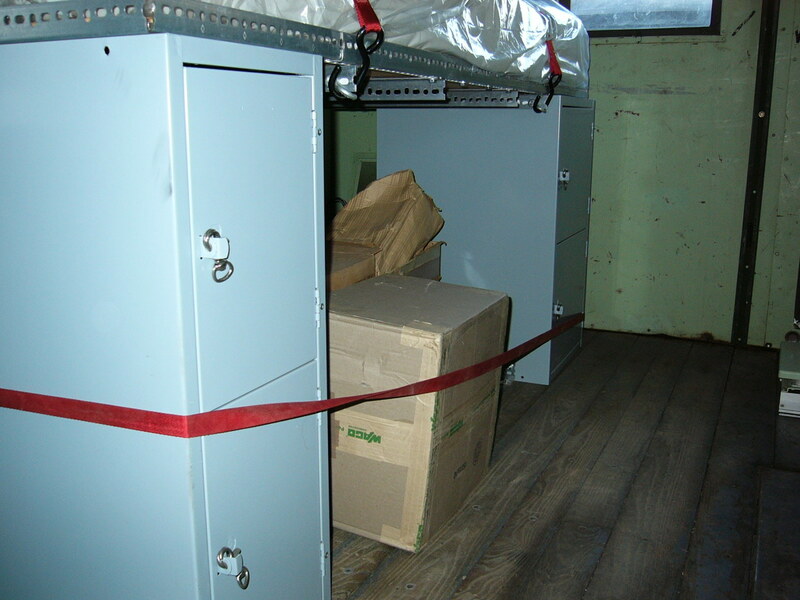 The hooks at the top of the ladder were made from round bar stock, while the correct ladder had flat hooks. I replaced the round hooks with home-made flat ones that hold the ladder much more securely. The bottom step a bit bent. 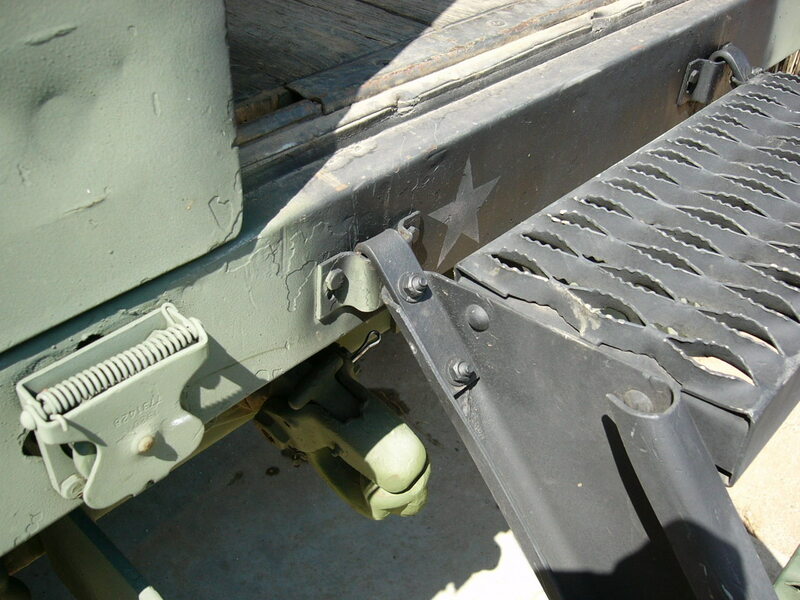 The folding front bumper step makes it a lot easier to climb up to the engine compartment, and it conveniently folds out of the way so it won’t get snagged on stuff when driving off-road. I replaced a leaky valve on the emergency brake line with a brand new ball valve. I’ll include a matching one for the service brake line, as well as the leaky one that I removed. It may be possible to re-lap the original valve. 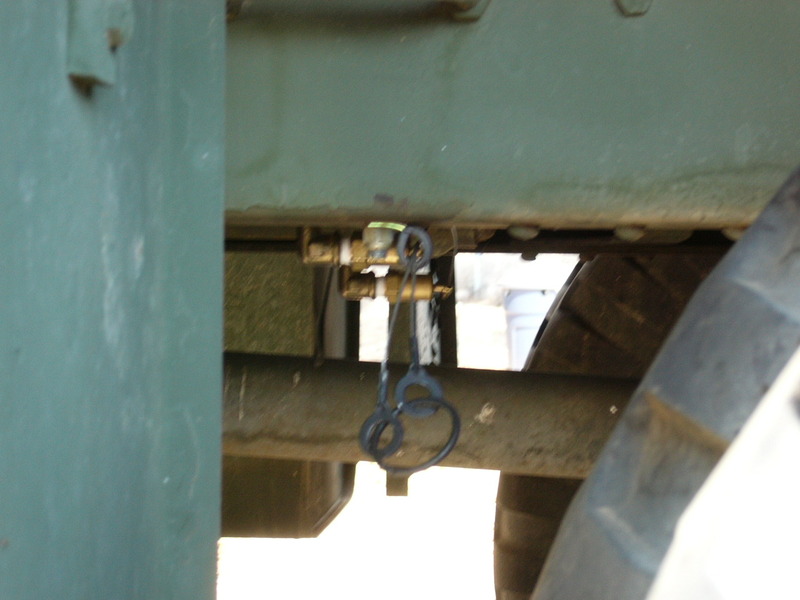 I also installed cable-pull air tank drain valves, which make it easy to drain the air tanks without crawling under the truck. 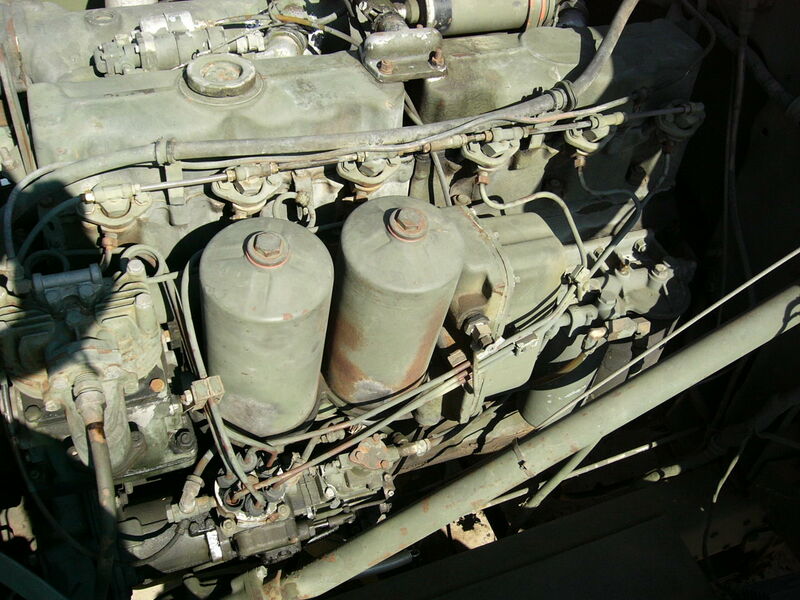 Here are some pictures of the engine. The turbo is not a “whistler”. 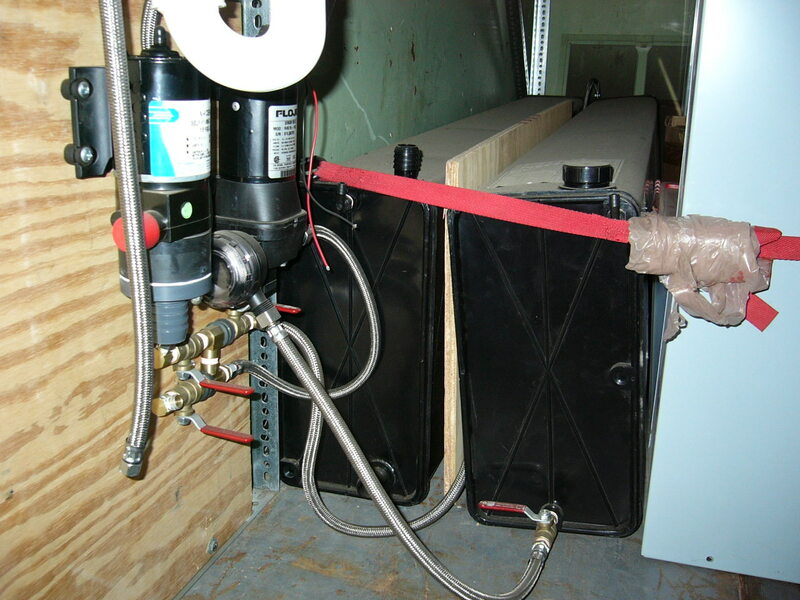 I have not tested the manifold flame heater, because it never gets cold enough here for it to be needed. 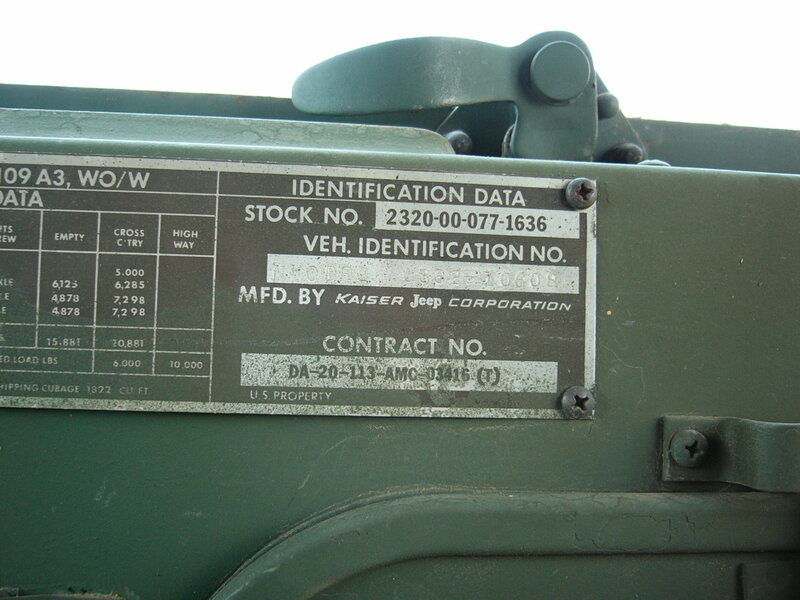 Data plates and gauges. All gauges work fine. 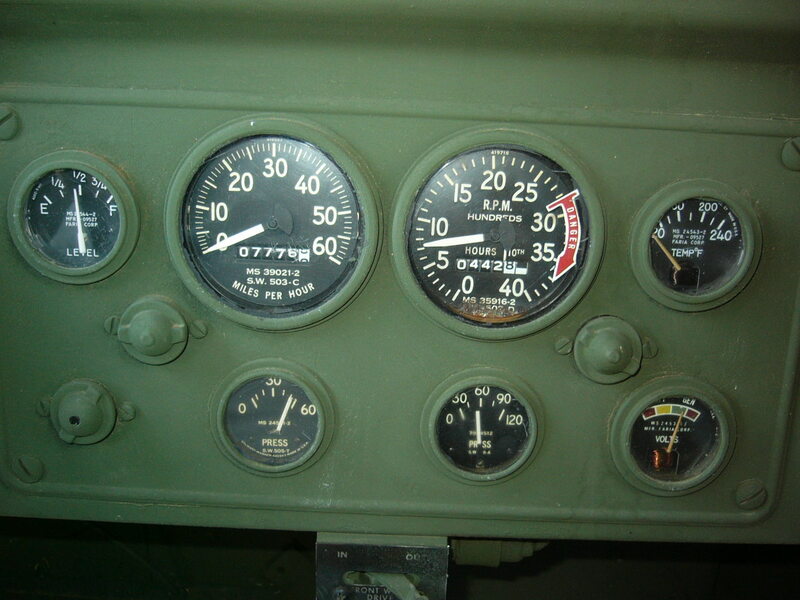 I took the picture of the gauges with the engine running, but the air pressure hadn’t built up yet. I made a Quicktime movie of the first cold start after the truck had sat for a couple of weeks, to show how quickly the engine catches. 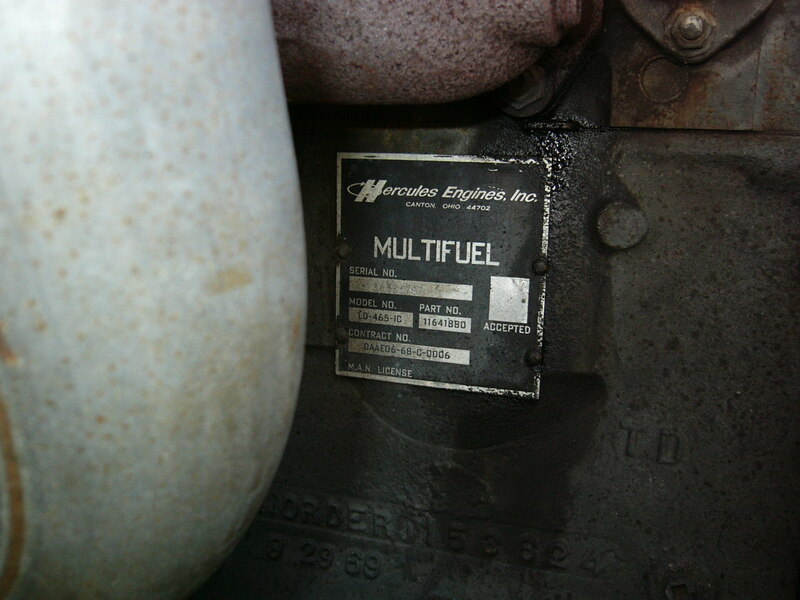 The movie runs until the engine builds up oil pressure. The cab is in nice shape. 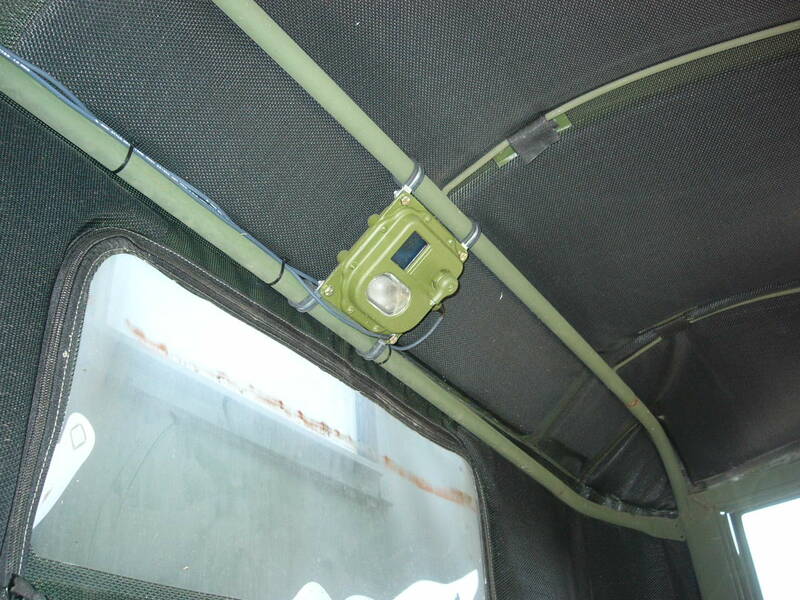 I added a dome light from an armored vehicle, and a home-made cup holder (based on plans that were described on MIL-VEH a long time ago) clips into the rifle rack. The driver’s seat back cushion is thrashed, but I’ll include a set of four new seat covers from John Tennis. I have not installed them, so they’ll stay clean until the new owner takes over. 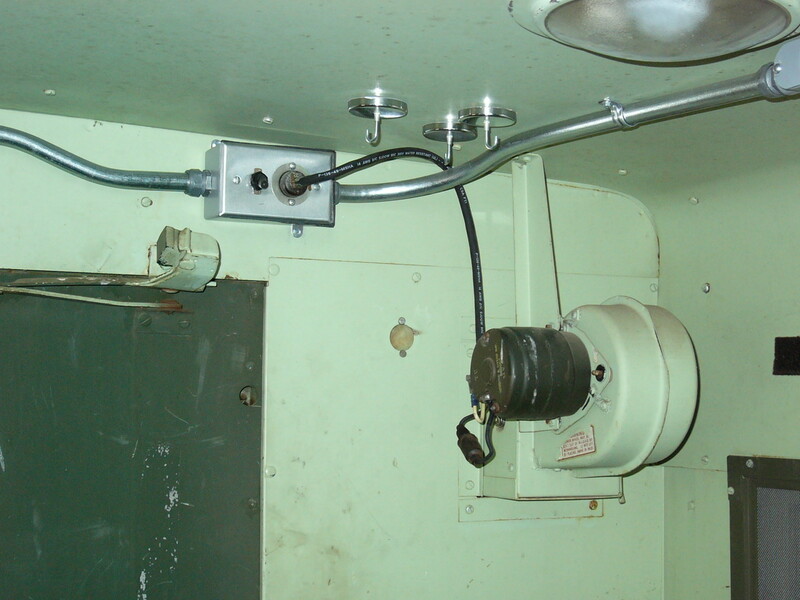 I’ll also include a NOS cab heater kit, with reproduction mounting brackets for the heater box (which weren’t included in the kit for some reason). 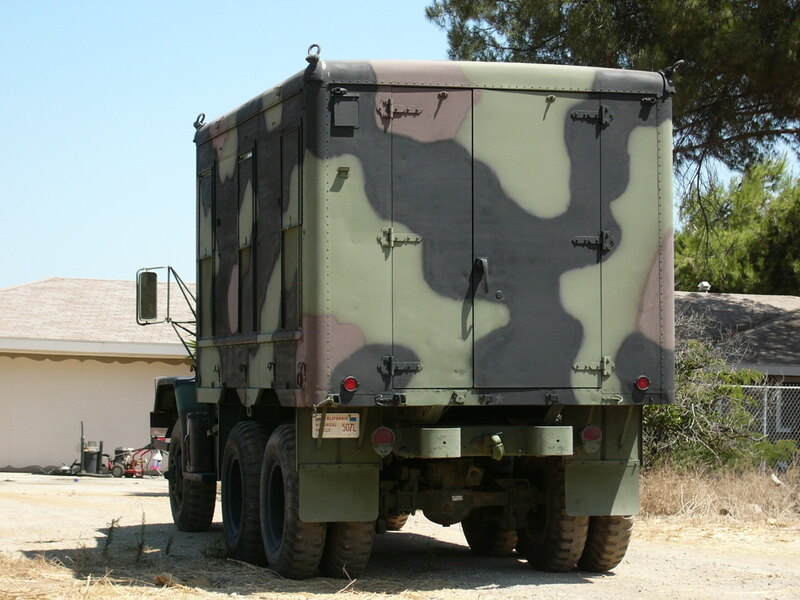 The transmission cover has the slot, latch and markings for truck with a front PTO-driven winch, but this truck does not have a winch or PTO. The cover must have been swapped from another truck at some point. 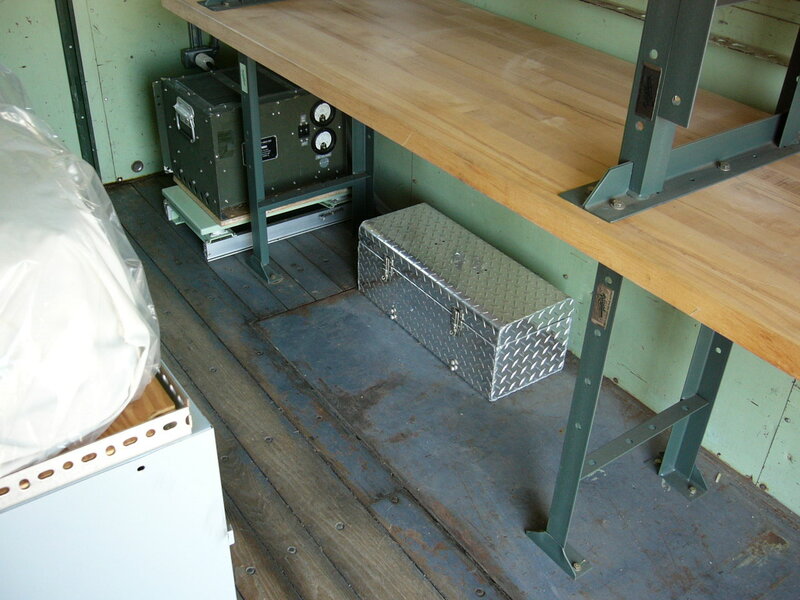 The van box is partially converted to be a combination camper and radio shelter. 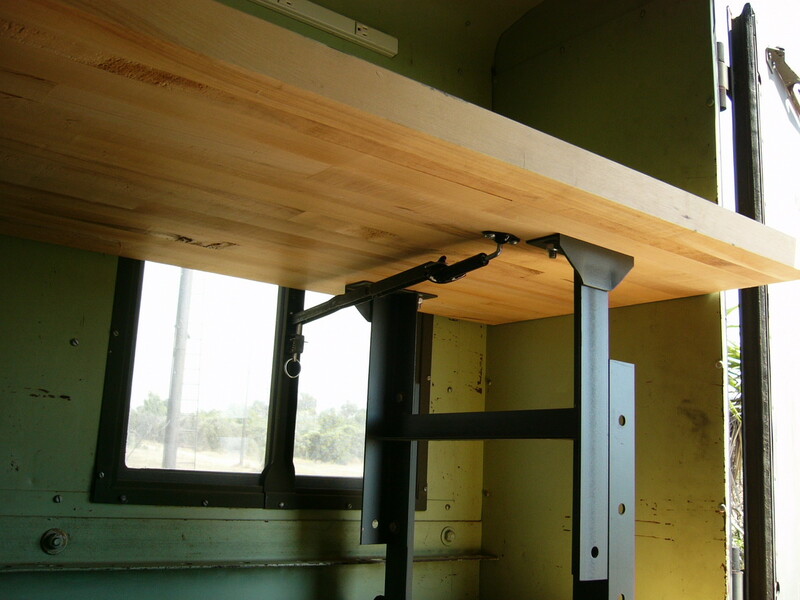 A double-stack of 10 foot wide by 2 foot deep workbenches with 2 inch thick solid maple butcher block tops and heavy steel legs is bolted in place on the right side. 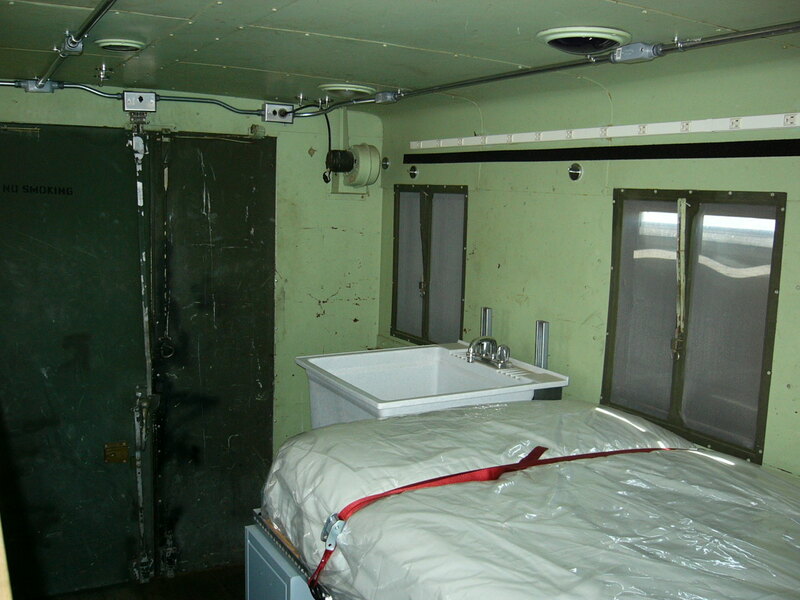 The left side holds a twin bed, storage lockers, plumbing, and room for additional storage and equipment. 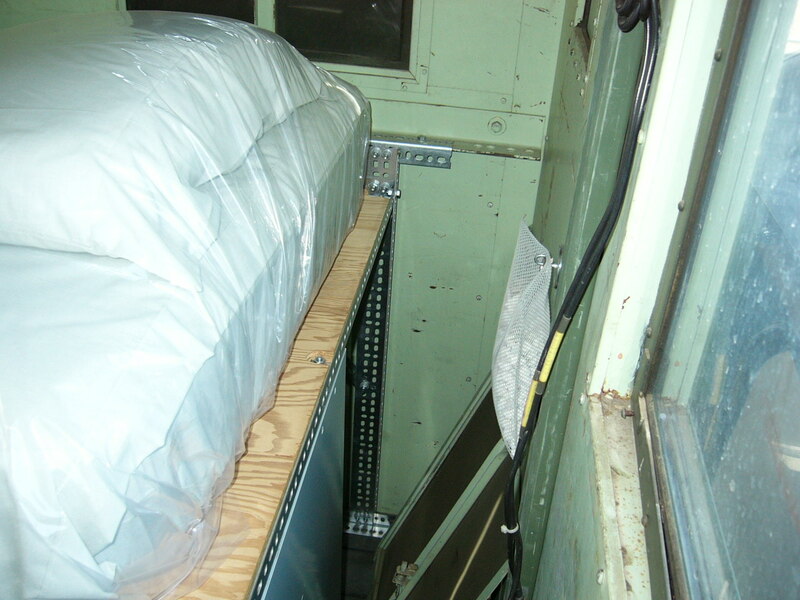 The bed comes with brand new sheets, pillow and mattress cover, so you won’t need to sleep in my cooties :-). I covered it with a plastic sheet to keep it from getting dusty. 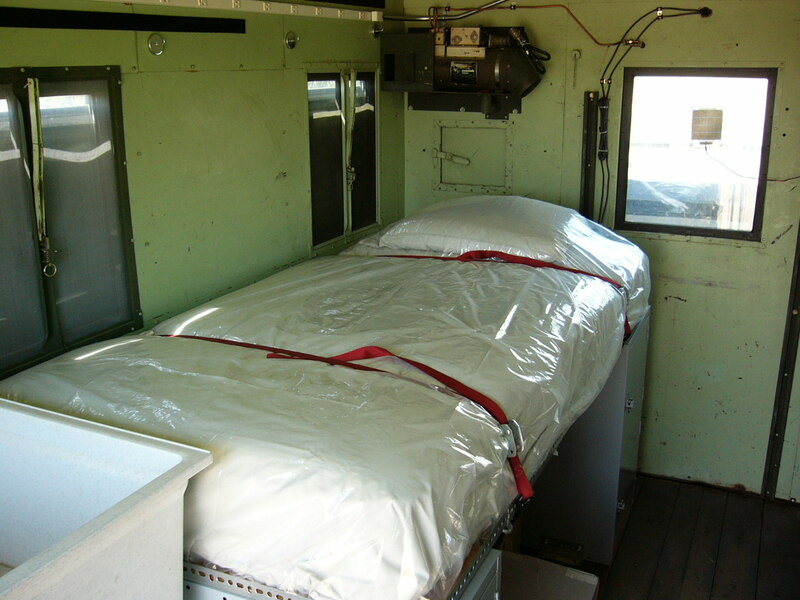 The mattress is used. You can replace it with an ordinary twin mattress if that bothers you. I ripped out all of the old AC and DC power wiring in the van box. It wasn’t in great shape after 35 years, and I didn’t like the way it was done, anyway. I put in all new wiring in surface-mounted conduit. 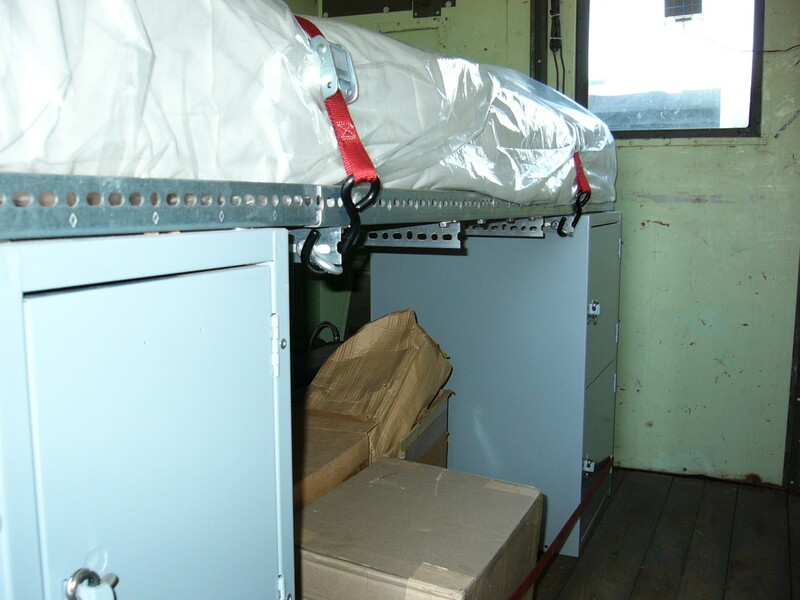 It should be safer than the original wiring, and it’ll be a lot easier to make repairs and upgrades in the future. 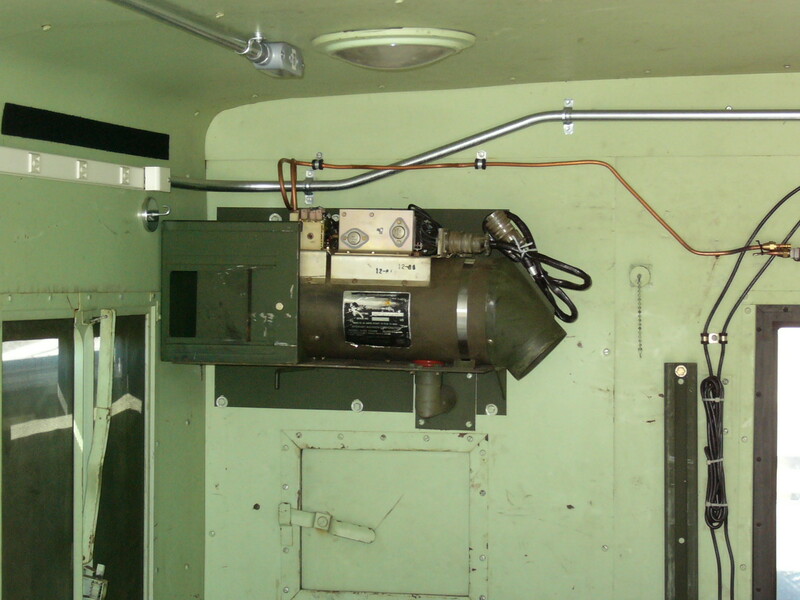 I retained the special switch for the AC lighting (it’s a 3-position switch with a mechanism to prevent the user from switching from blackout mode to normal mode with a single push of the lever), and the exhaust blower. 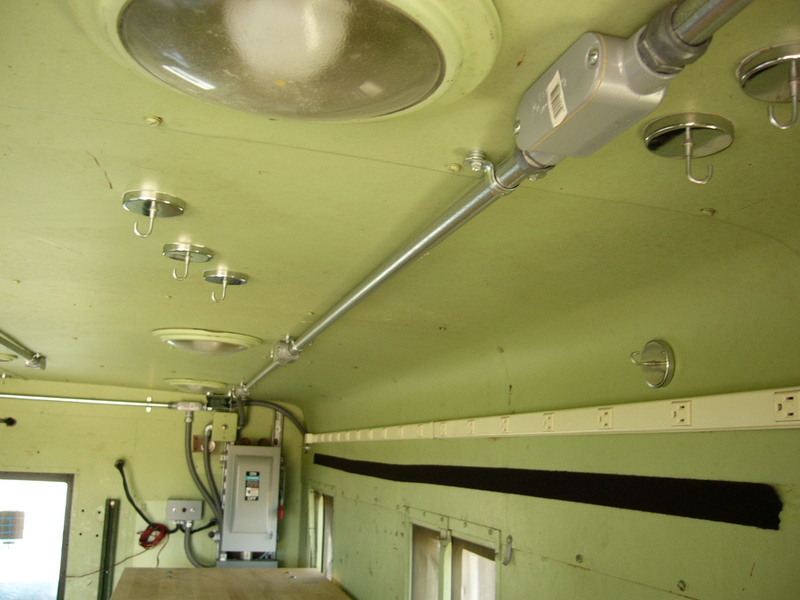 Wiring to all of the AC and DC lights is now in conduit, except for the final few inches to each light. 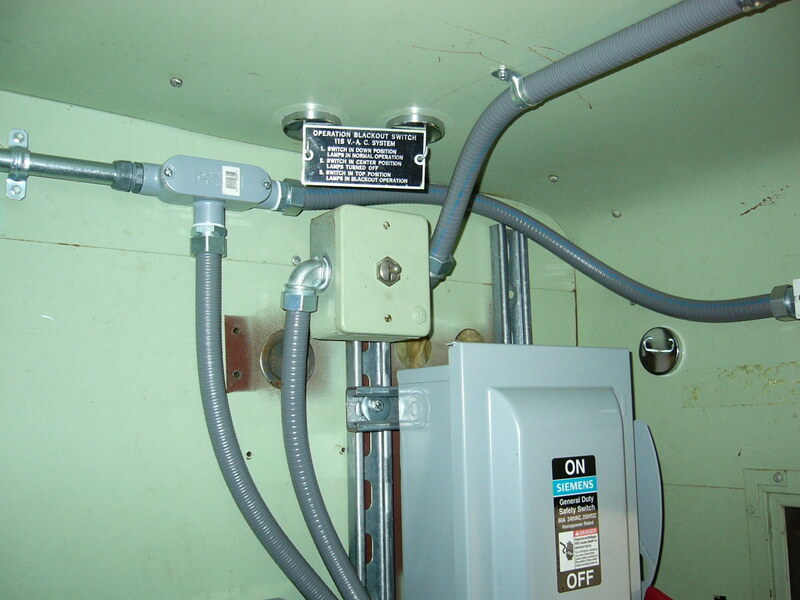 The exhaust blower switch is now located near the blower, instead of near the breaker panel. 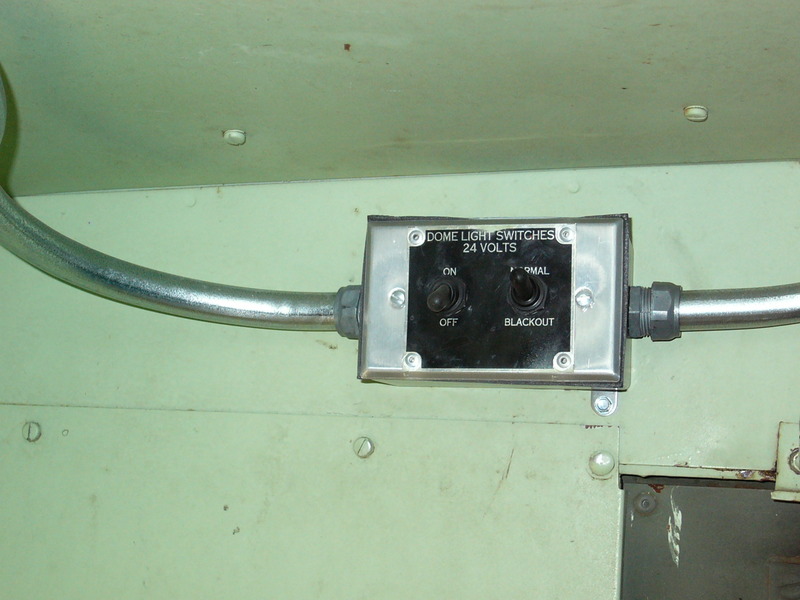 The 24V lighting switches are in the original location, but are now in an electrical box. 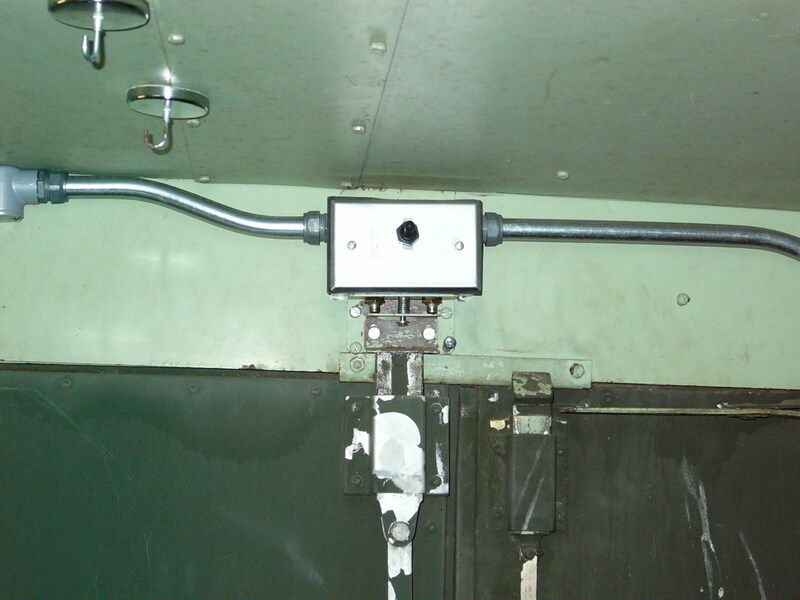 The door switches are new, and mounted in an electrical box. I added a toggle switch which lets you force the AC lights into “blue” mode with the door latched if desired. The Plugmold strips are all new. I still have a lot of the old stuff that I took out of the van box. I removed the original 120VAC 60A Arktite power entry connector, and replaced it with a 120V/240V 60A IEC 309 pin and sleeve connector, which happens to have the same mounting hole pattern. The new connector is a bit less expensive than the Arktite connectors (but still not cheap), and allows twice as much power to be brought into the van. 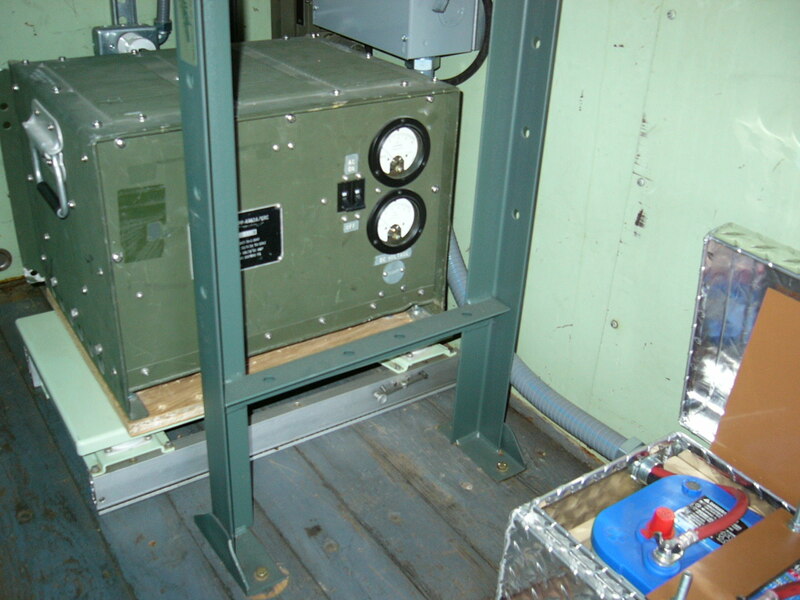 I originally planned to run the van box from a 10kW diesel generator, and the original 120V 60A connector wouldn’t let me use the generator’s full output. 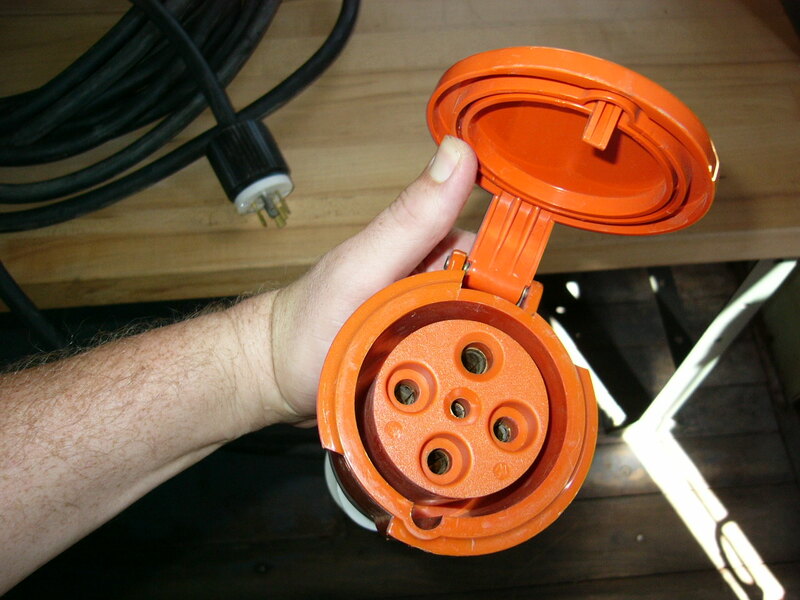 The included power cable is wired for a 20A feed from a NEMA 14L-20 twist-lock connector (which is usually available at larger hardware stores). A much heavier cable would be needed for the full 60A feed. I’ll include the pair of connectors needed for the other end of that cable. The van box has a fuel-burning heater, but it floods when I try to start it. I’ve disconnected the wiring and fuel feed for safety. 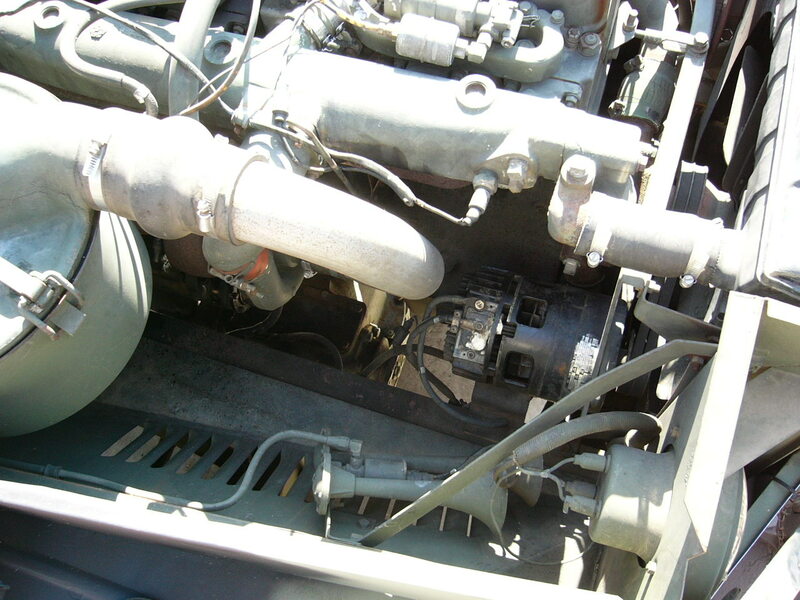 A second pull-out heater is included that might be good for parts, though it’s a different model. 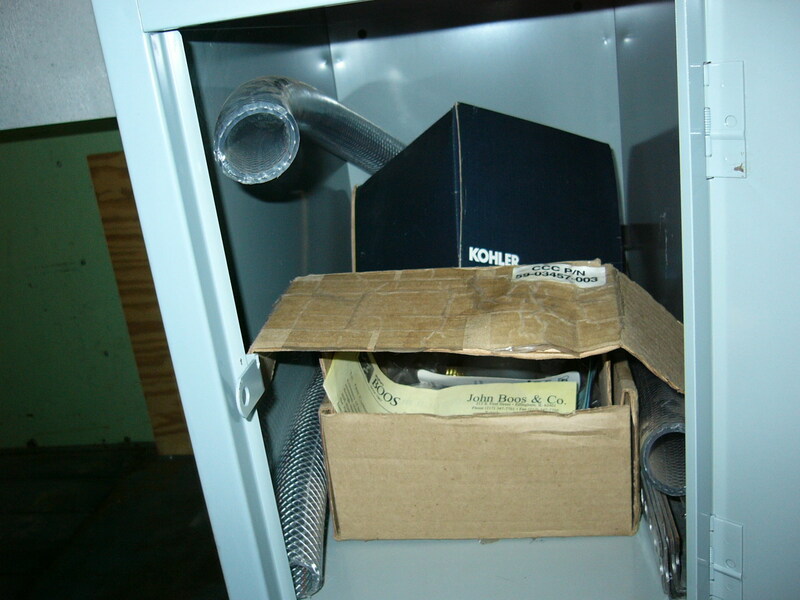 I never got around to digging inside the installed heater to see what might be wrong with it. 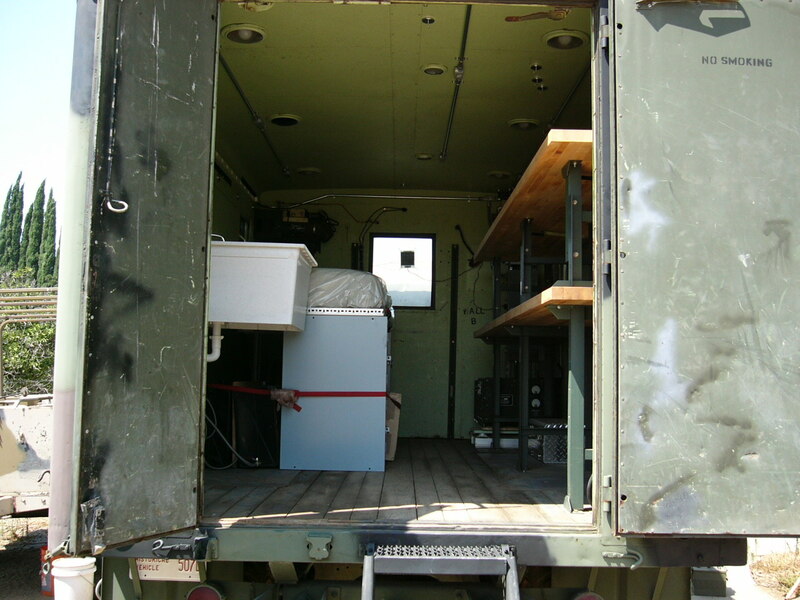 I was planning to install military radios in the back that would need lots of power at 24VDC. 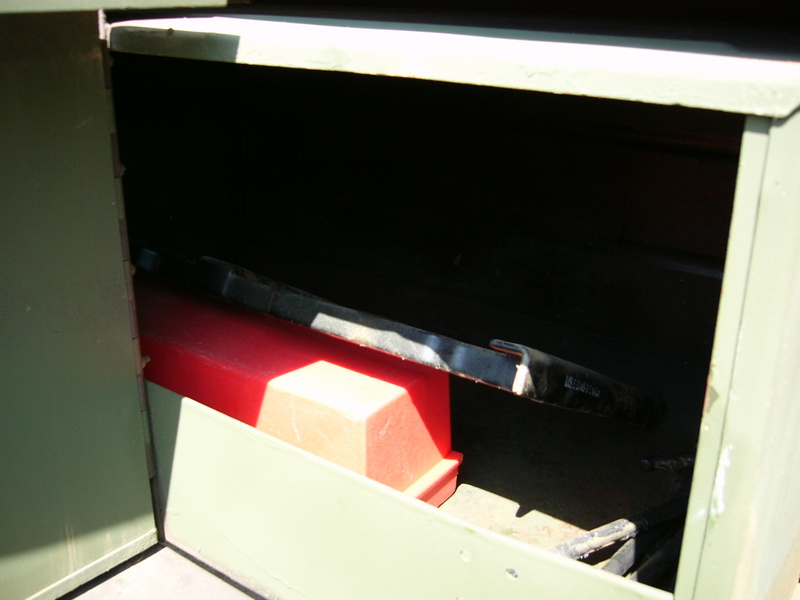 A pair of Optima deep-cycle batteries are mounted in a metal toolbox under the benches, both to provide 24V power when not using a generator and to provide surge current for things like dynamotors. 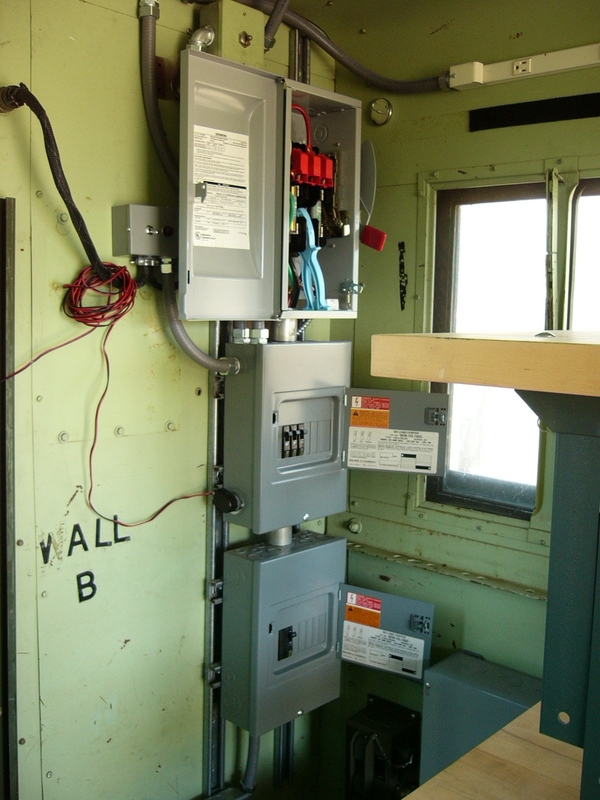 They’re connected through a heavy-duty disconnect switch to a big set of terminals. 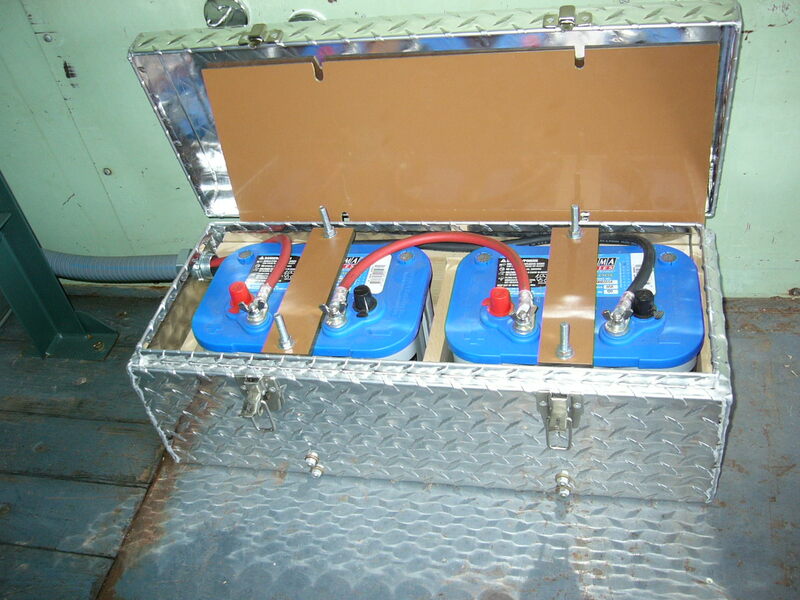 A bank of four high-current diodes lets up to four independent sources recharge the batteries. One of those sources is the vehicle’s alternator, via a 50 amp breaker in the green box on the wall. The alternator probably won’t fully charge the van box batteries because of the voltage drop across the diode, but it’ll at least keep them up if a load such as a refrigerator (which I never got around to installing) needs to be operated on the road. 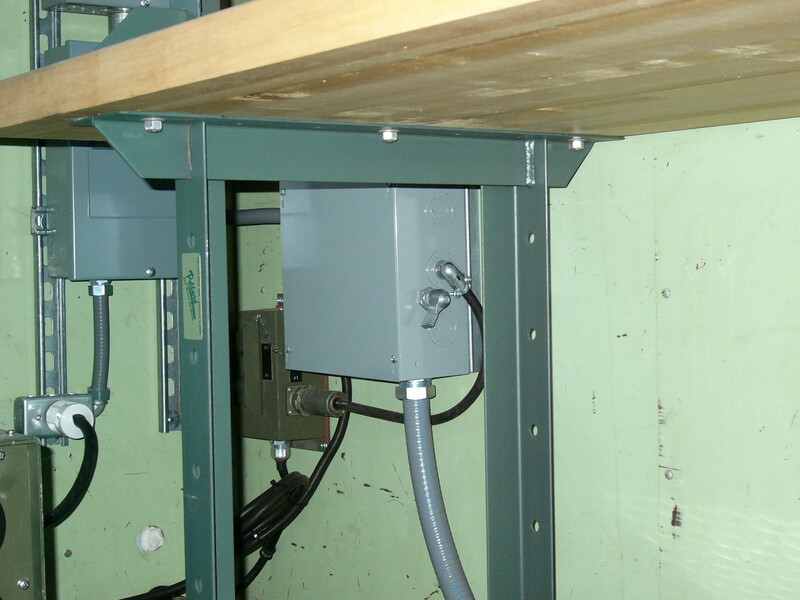 The main charging source is a PP-4763A power supply, which is conservatively rated for 50A output at 28VDC. 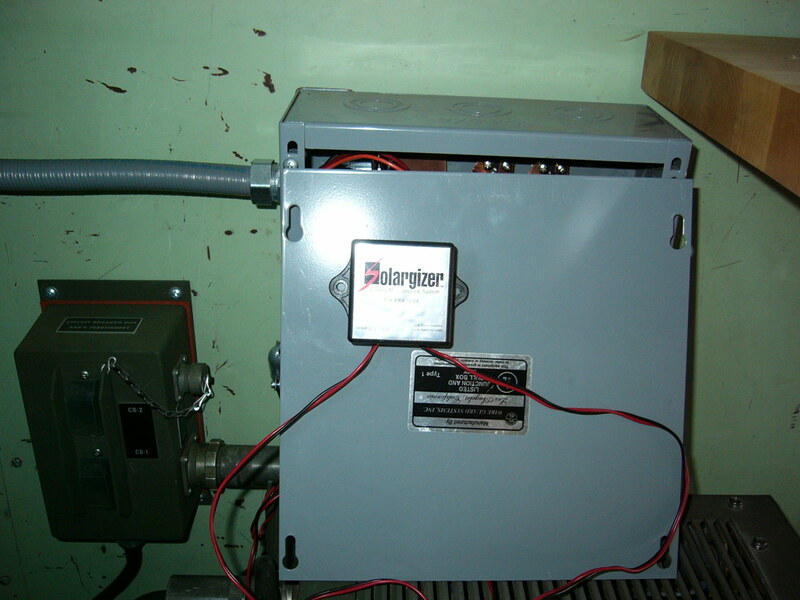 I have it wired for 240VAC operation. 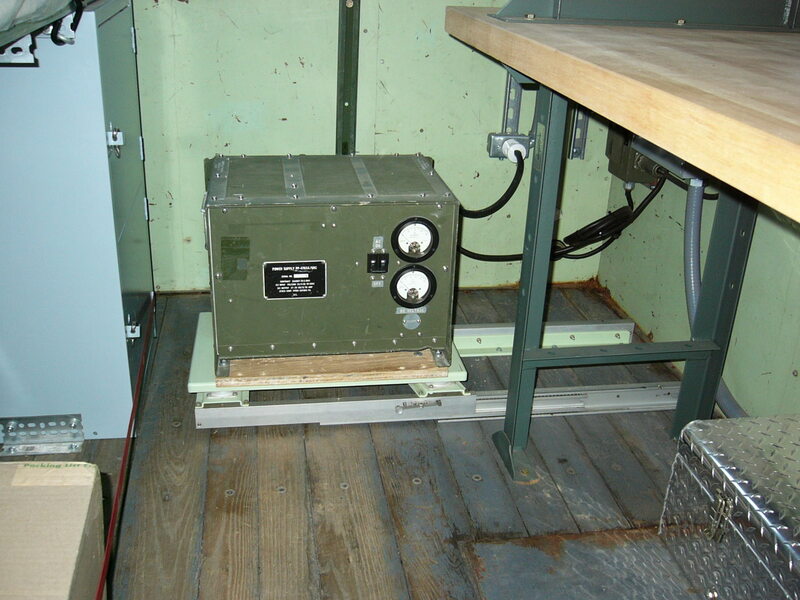 It’s mounted on a set of heavy-duty slides that came from a teletype. 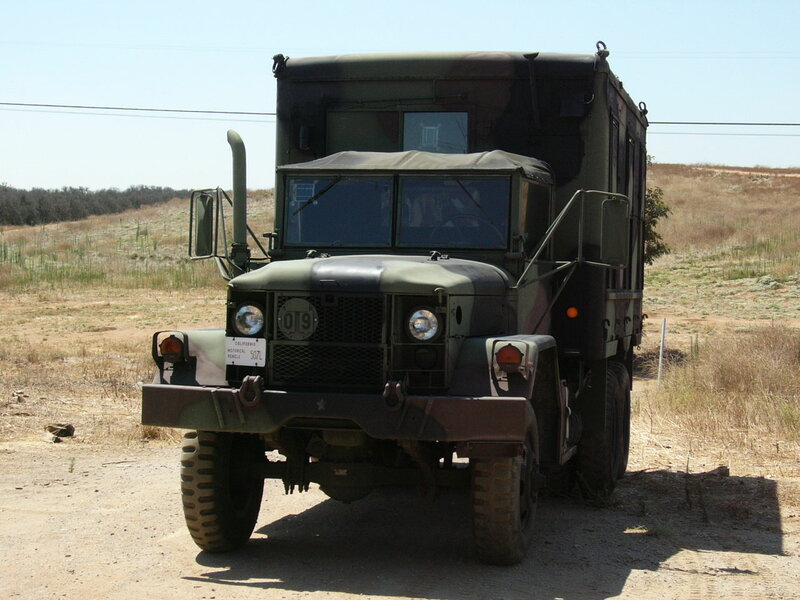 I’d really like to keep the PP-4763A, but I understand that it’s an important part of the package if the buyer plans to install radios in the back. 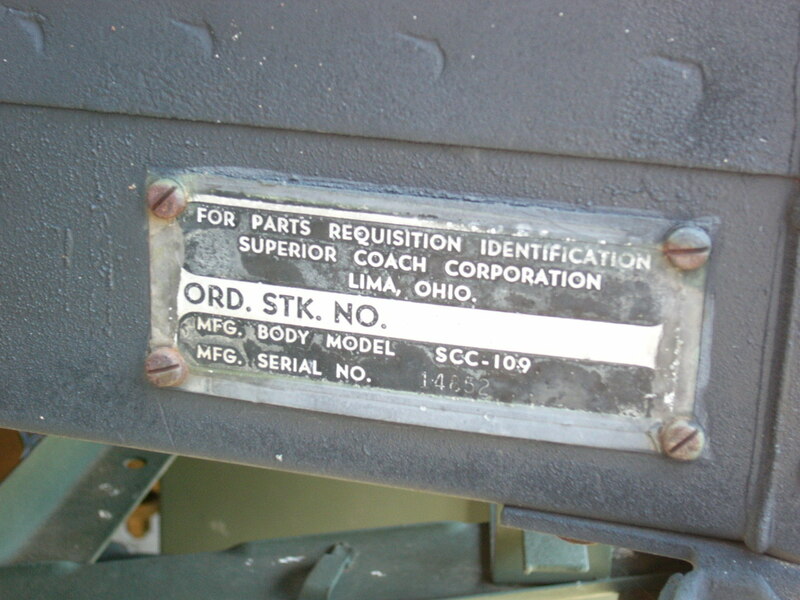 I’ll knock some bucks off the price or throw in something extra if I get to keep the PP-4763A. If I were doing this all over again, I’d probably add a big fuse in the main battery lead. Two of the isolation diodes are unused; I originally planned to add a larger solar panel, and a smaller 24V power supply. 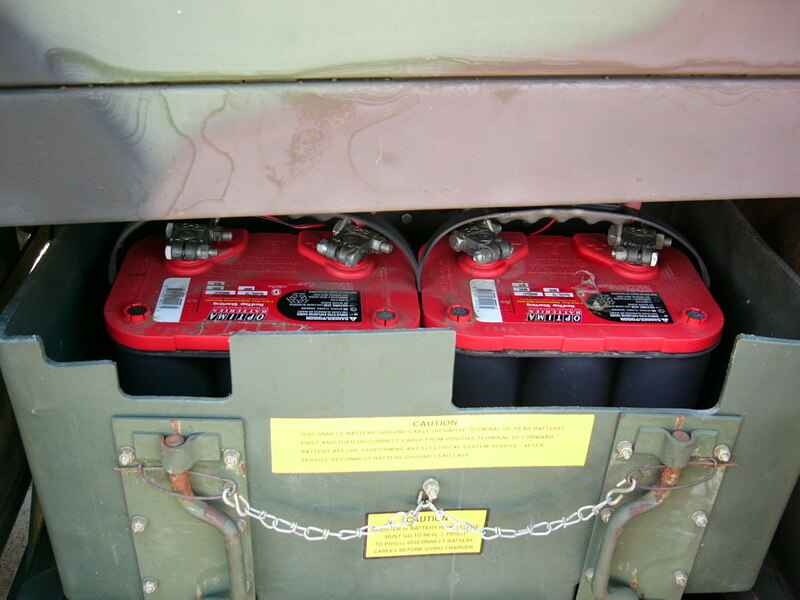 The truck has two Solargizer battery maintainers, one for the main vehicle batteries and one for the van box batteries. 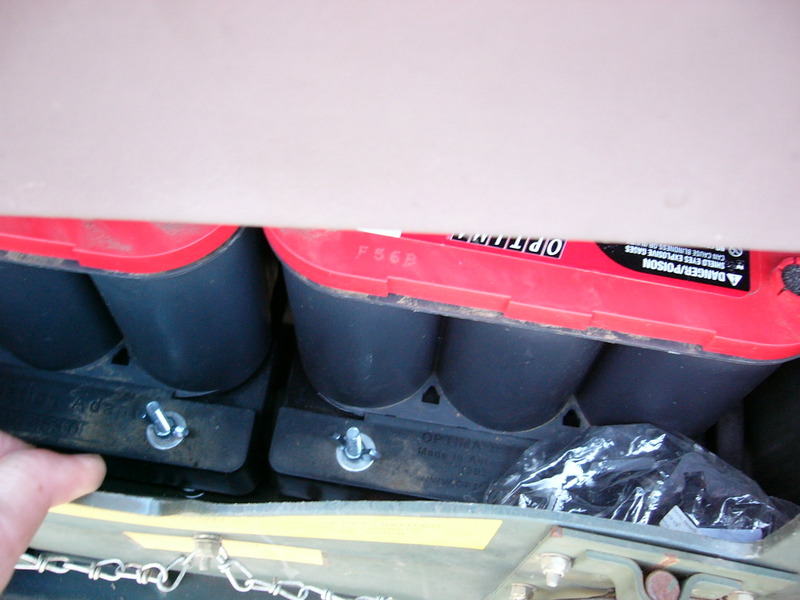 When the original 6TL batteries failed recently, I replaced them with Optima red-top batteries. They’re mounted in Optima’s 6TL battery adapters. 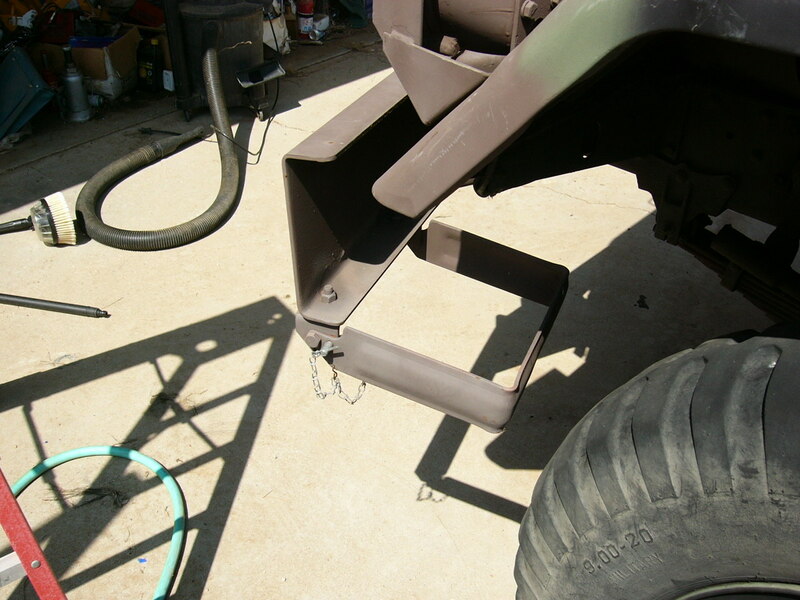 The original frame and J-bolts are included if the buyer ever wants to switch back to the military batteries. 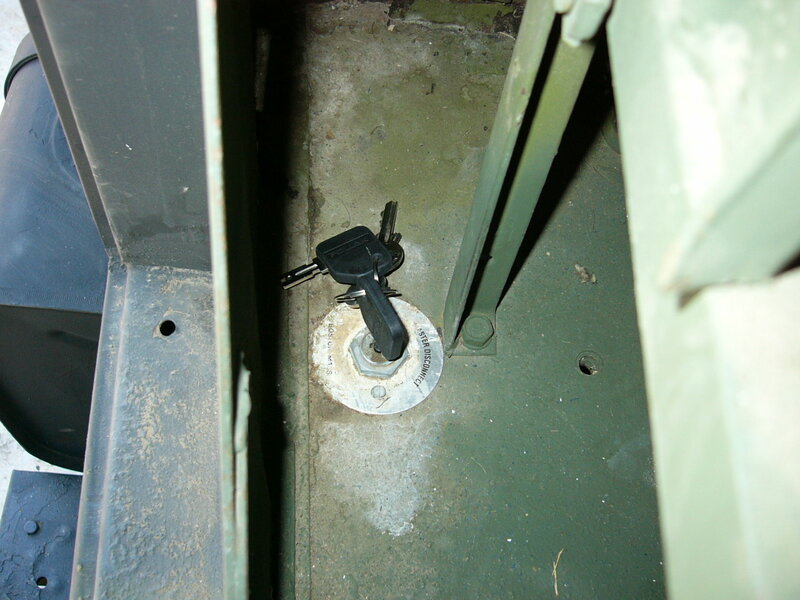 A keyed disconnect switch is installed in the positive battery lead and is mounted through the cab floor. I never finished the plumbing. 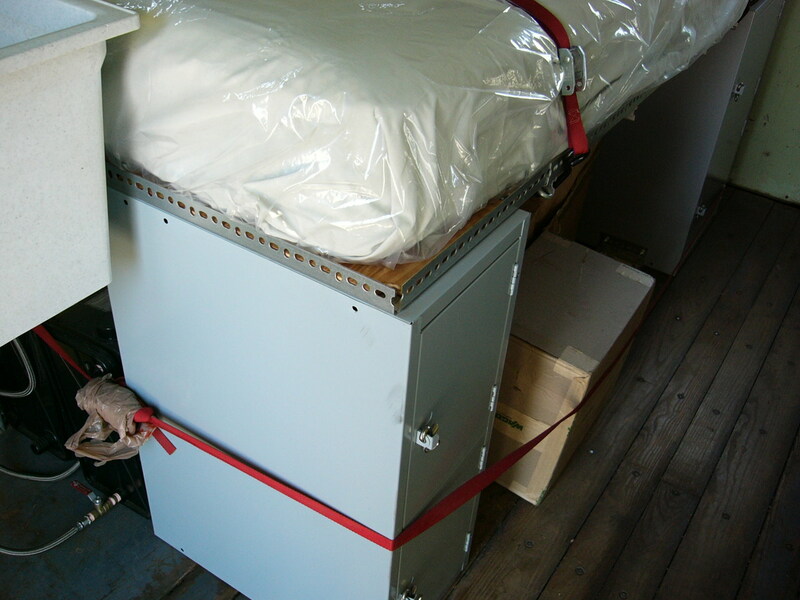 A pair of water tanks (one for fresh water and one for waste) are under the bed, but aren’t fully plumbed in or secured yet. I installed a laundry tub sink and pumps for fresh water (drawing from one tank and feeding the sink) and waste water (to empty the waste tank through a narrow hose, without cutting a hole in the floor for a gravity feed). The new buyer can either complete the plumbing installation (much of the needed parts are included), or rip it all out. 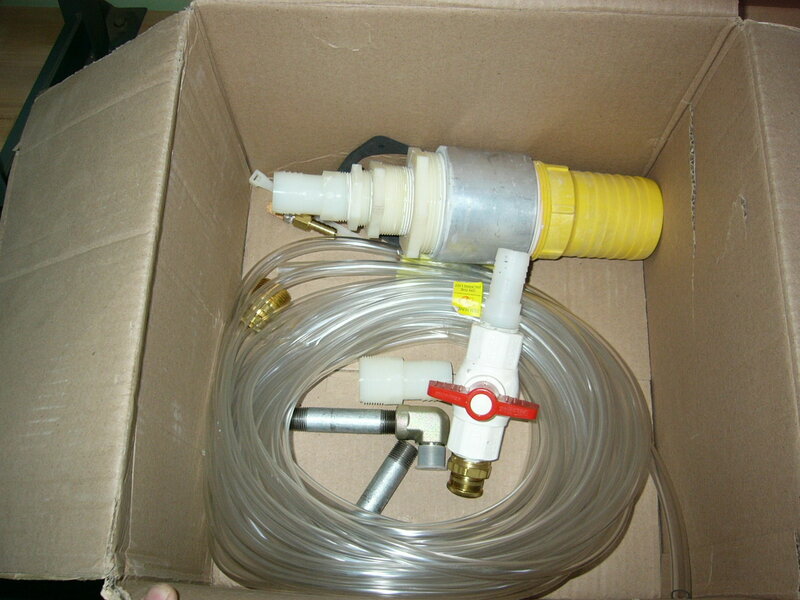 The fresh water pump will run from 24VDC. The waste pump that I installed needs 12VDC, and I made a custom flange to plumb in the size of hose that I planned to use. 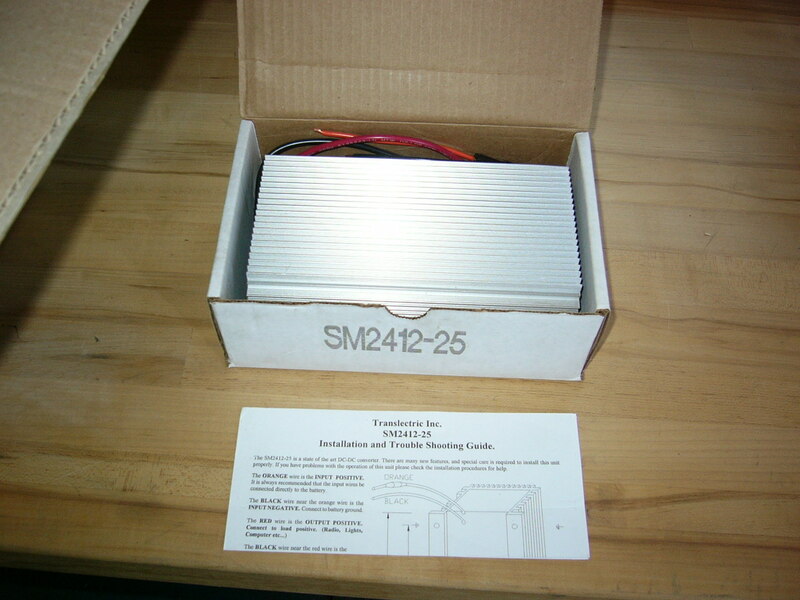 I’ll include a 24V-12V DC-DC converter to run it. 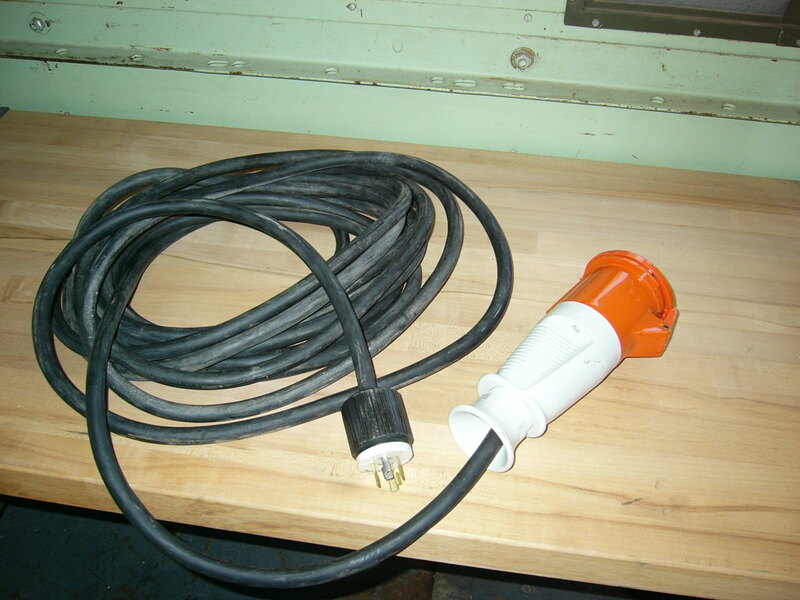 After installing the pump, I found that West Marine sells another version of the pump that runs from 24VDC and has the right tube fitting, so you might want to just replace my hacked-up pump and skip the 12V supply. I had planned to add an AC-powered on-demand water heater, but I never bought it. 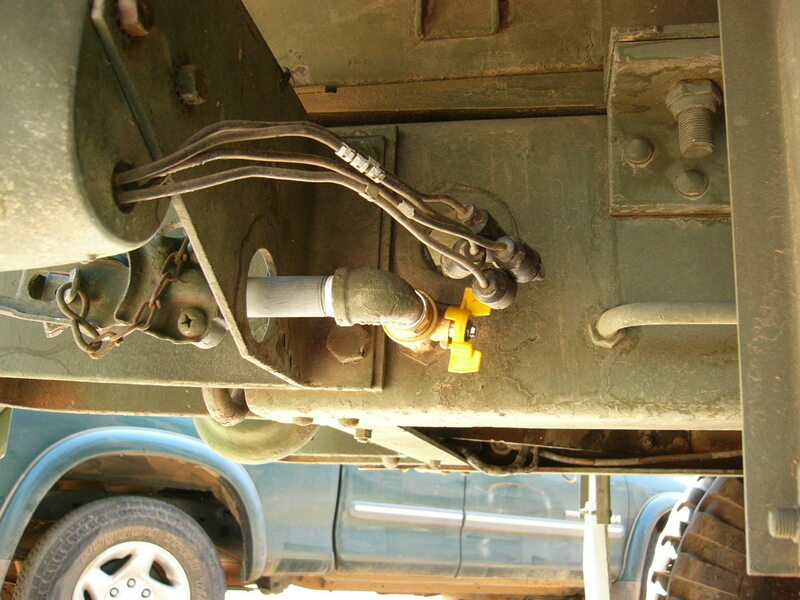 Most of the needed plumbing for the heater is in place. 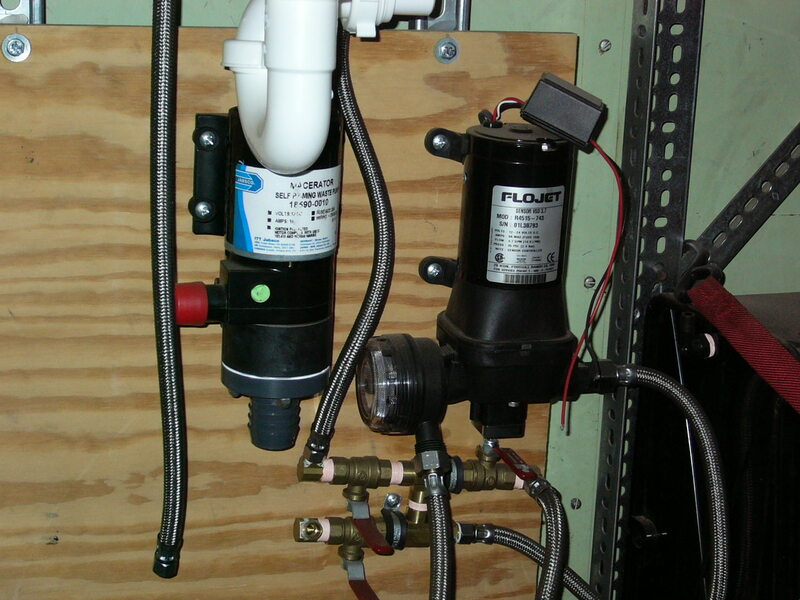 There’s also a return line from the valve group (on the output side of the fresh water pump) back to the fresh water tank, which I added to allow the pump to recirculate fresh water for tank cleaning and flushing. 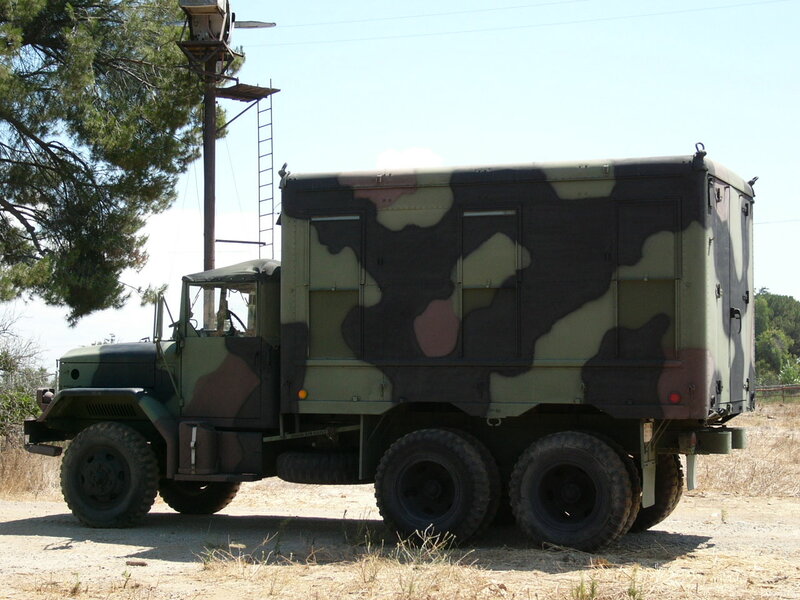 The truck includes a set of olive drab tarps which can be used as blackout curtains inside the van box. They can be hung with magnetic hooks (a bunch are included). 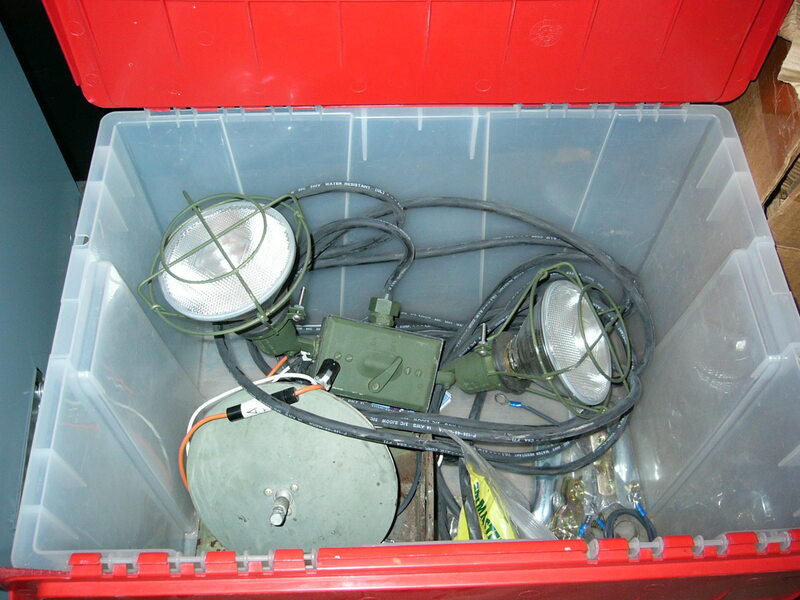 I also made a flood light assembly which mounts on the brackets on the sides of the van box. I’ve never seen a picture of the light that was intended to be hung from those brackets, so I don’t have any idea what it looks like. 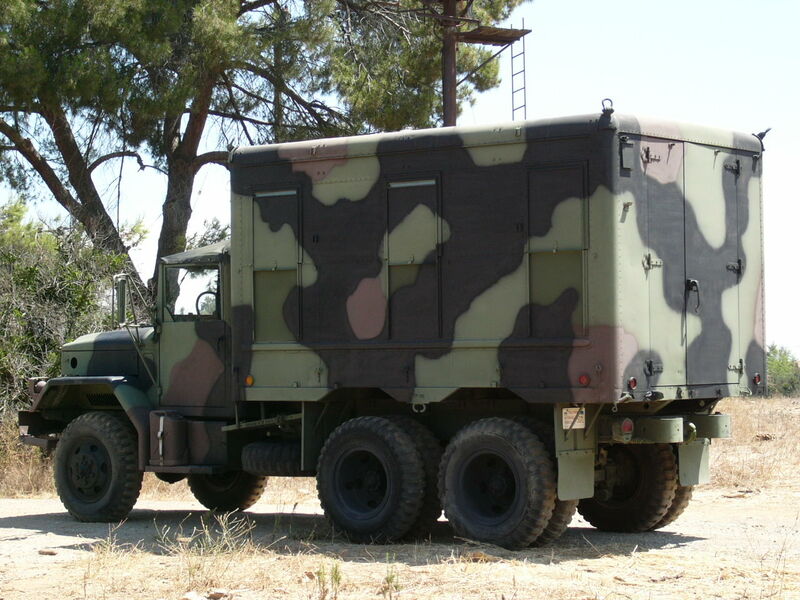 Hello sir, my dad has the m109a3 shop van aswell. 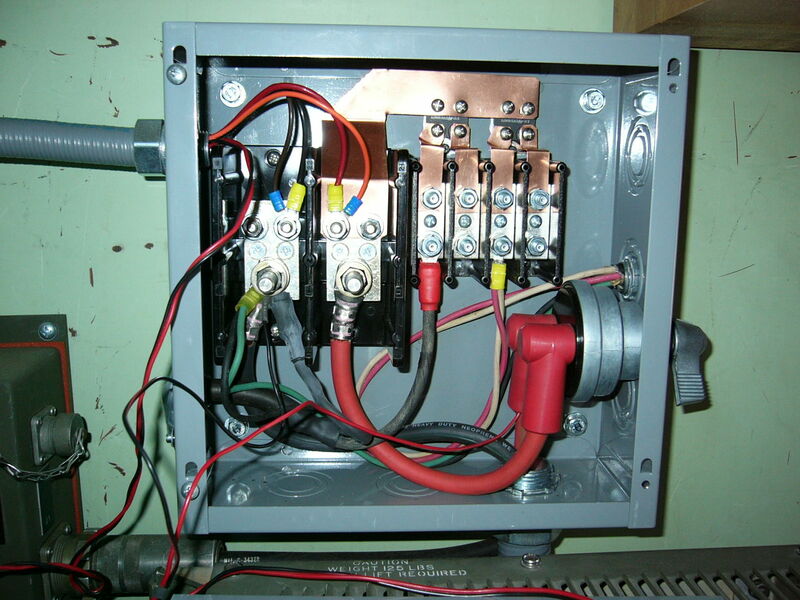 we have been wanting to set up the electrical system almost exactly how you did yours. 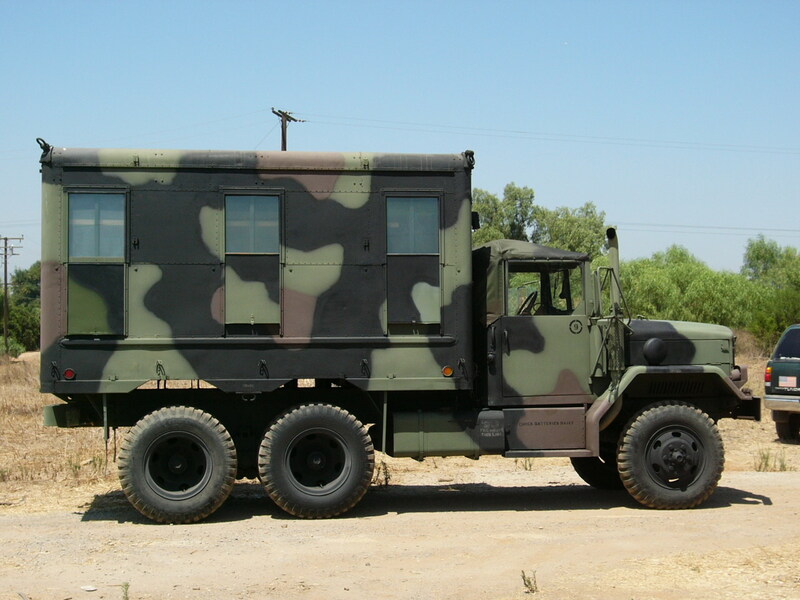 would you mind giving us all the specifications that you used and products that you used for your shop van. we would much appreciate it sir and we hope to hear back from you soon. Thank you and have a great day. 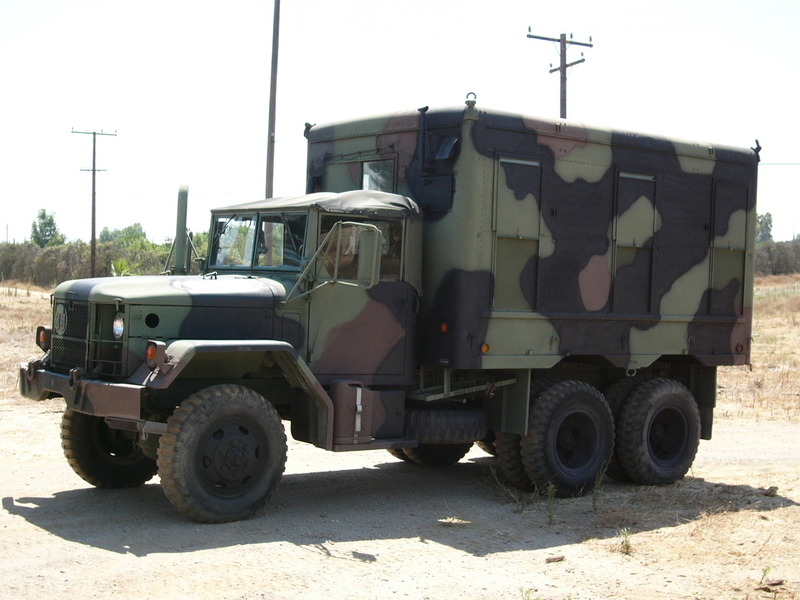 I’m sorry, but I sold this truck several years ago, and I didn’t keep any notes about the modifications that I made to it. 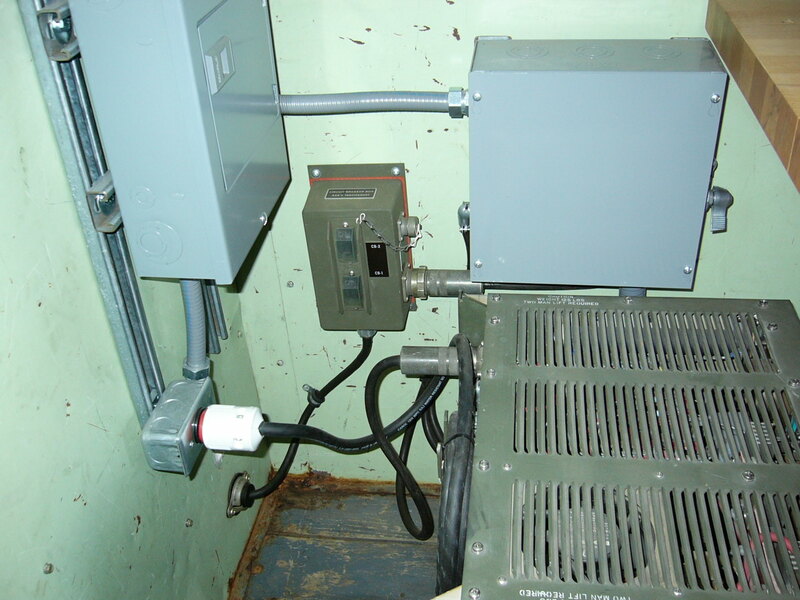 Did you use a converter for your DC output from main batteries to AC before you wired into the Safety Switch box? I didn’t have a DC to AC converter in the setup. 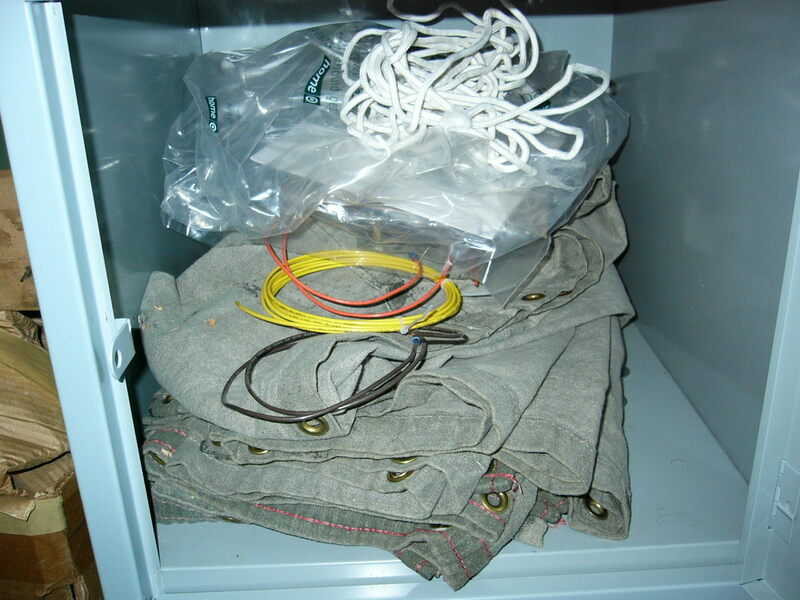 The batteries were there to supply 24V power for radios. 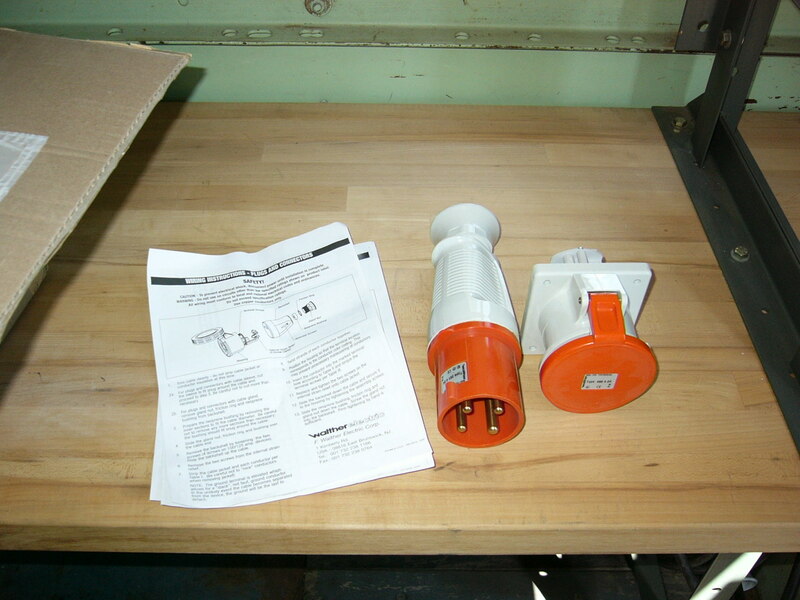 AC required an external power input from a power outlet or a generator.